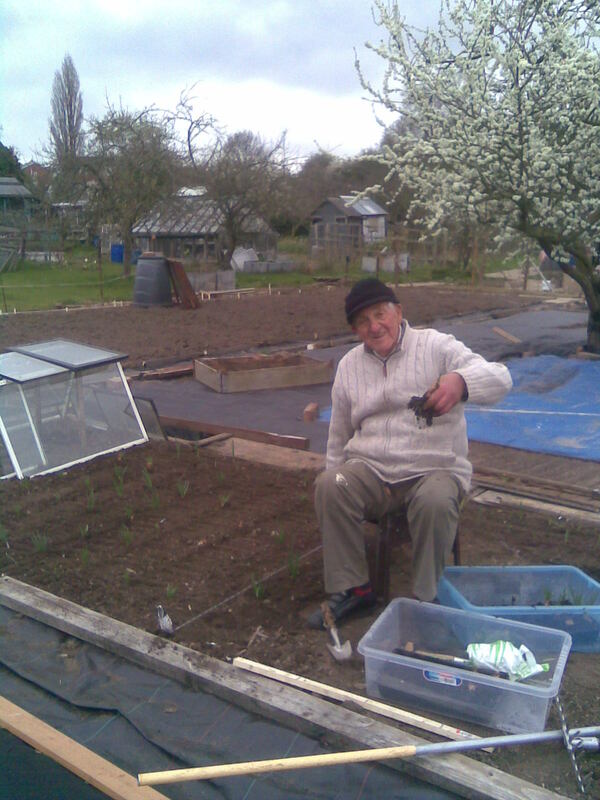 On Friday, Ed Stagg from Radio Leicester, rang and spoke to me regarding ‘The Good Life’, as the wonderful Richard Briers had recently passed away and he was discussing ‘living the good life’, on his Saturday program. This week Ed Stagg was joined by a model, a cook and a happiness expert. They had quite an interesting discussion after Ed had played my phone call and if you have a bit of time spare, have a listen and tell me what you think. You can hear the discussion here (approximately 1 hour 38 minutes into the program). 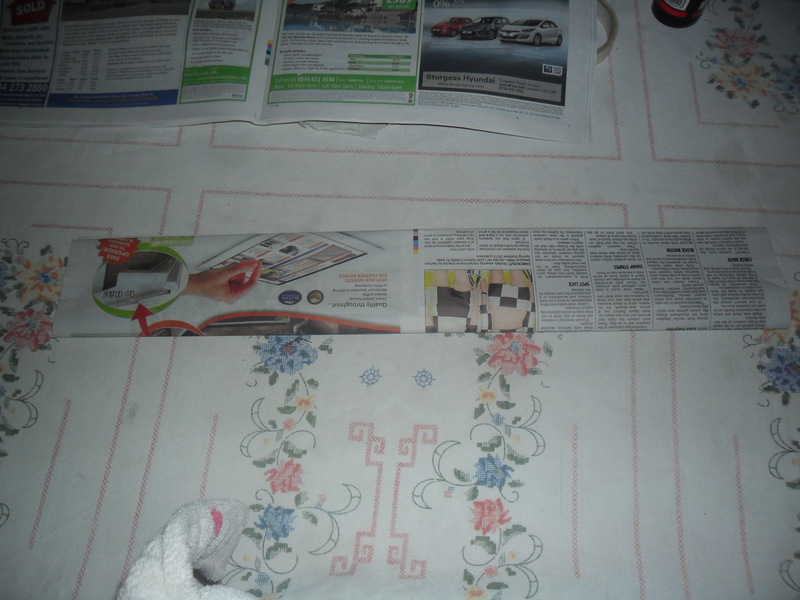 Chop the ends off each one and remove any damaged areas. You can then roast them in olive oil (approximately 45 minutes, Gas mark 6) or freeze them (to roast from frozen another time). 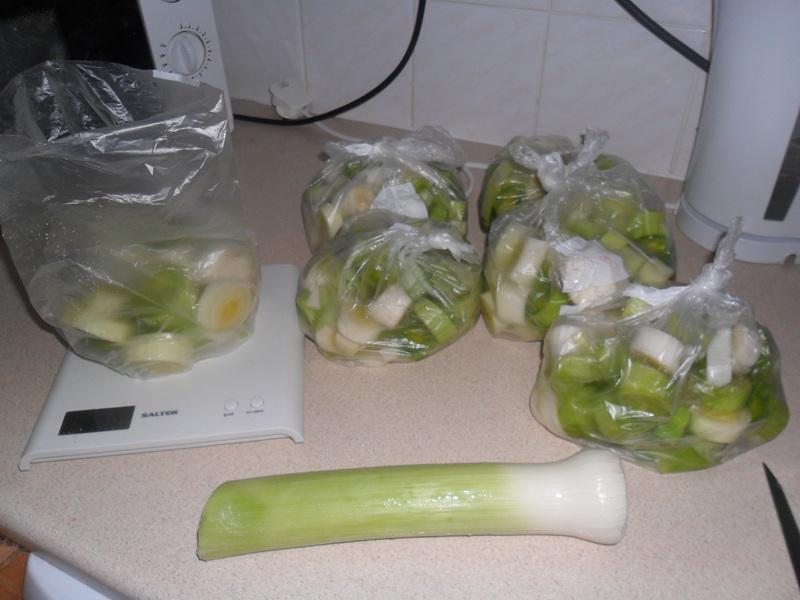 To freeze, all you need to do is blanch them for two minutes. 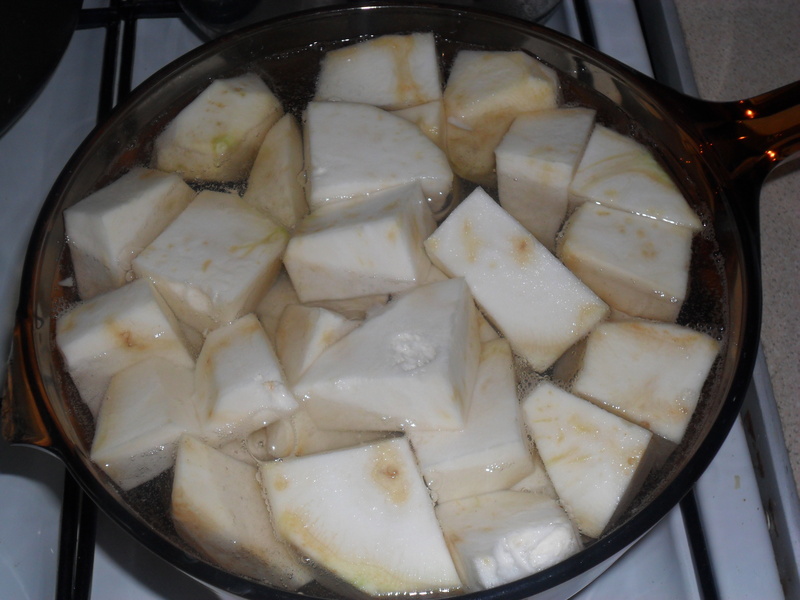 ….Boil a pan of water, then put the Jerusalem Artichokes into it. Bring the water to boiling point again and then time it for 2 minutes and then drain. Immediately plunge the vegetables into very cold water, to stop the cooking process. 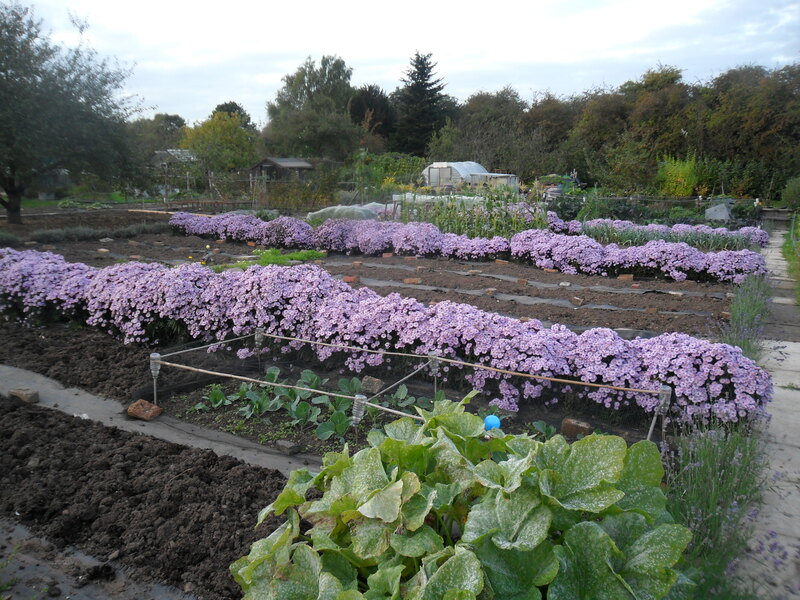 Lay the Jerusalem Artichokes onto a tray in a single layer and freeze. When they are frozen, put them in a bag. By freezing them in a single layer on a tray, they won’t all stick together and it will be easy to take out just the required amount that you need. 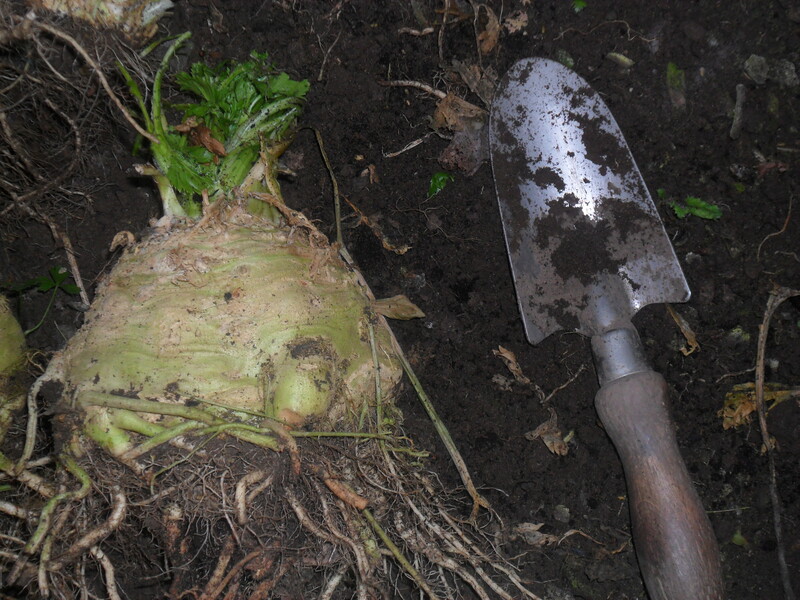 Celeriac is a bit easier to prepare as you just need to remove the skin, wash and chop into usable sized chunks. 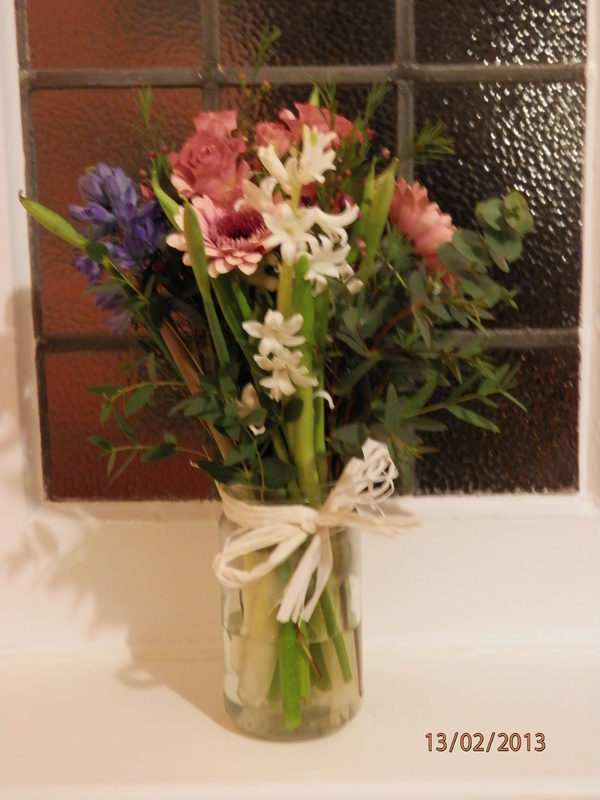 Again, I freeze mine at this time of year, so we are never without them. 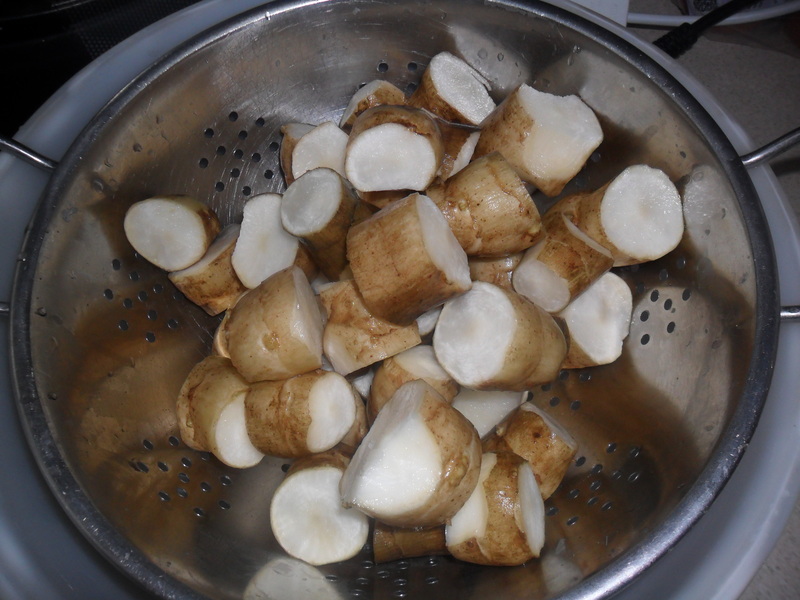 To freeze, blanch for two minutes, exactly the same way as the Jerusalem Artichokes. 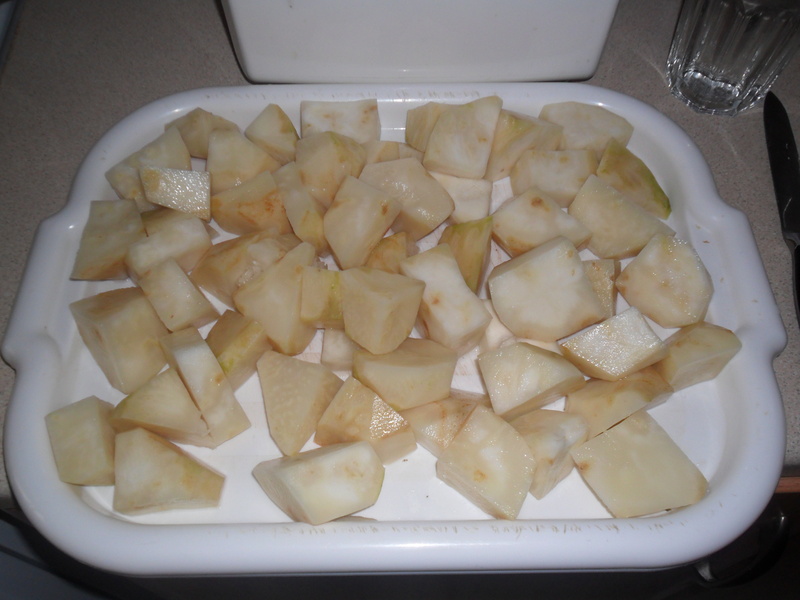 I use the turnips in a different way to roasting, I use them to make a cheesy gratin as a side dish with meals. I’ll show you how I make it another day. 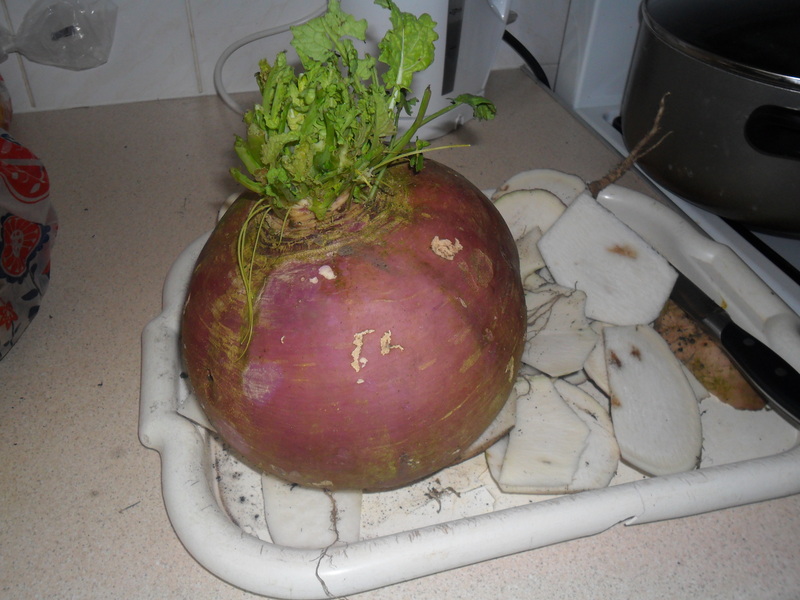 I left the turnips a little bit too long in the ground and the biggest weighed 1.9kg! 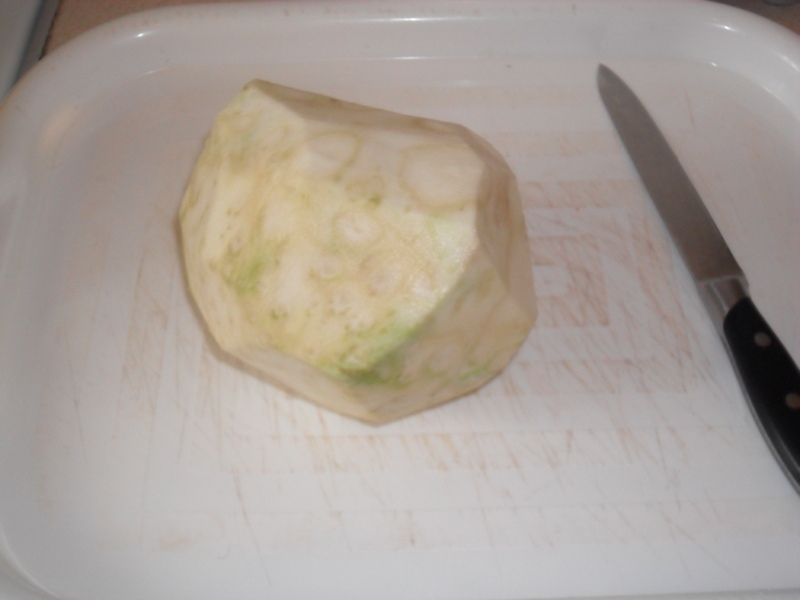 I froze it exactly the same as the Celeriac and the Jerusalem Artichokes above, only this time I blanched it for just one minute. 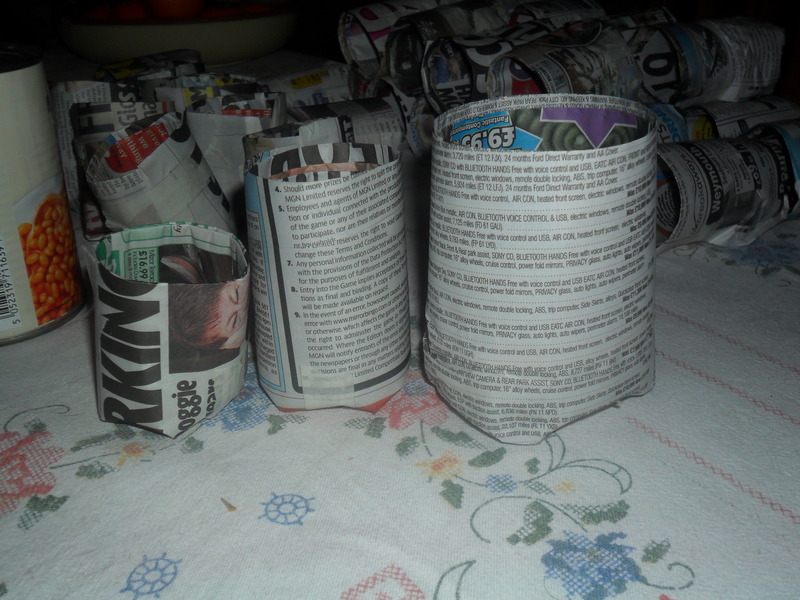 On Friday I promised to show you how I make newspaper pots. 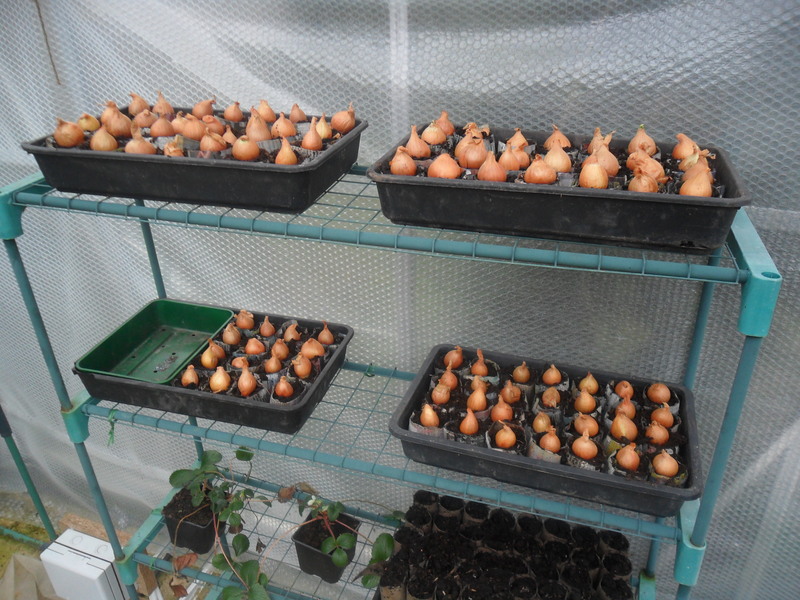 My shallots are sitting happily in my cold greenhouse in the pots I made. 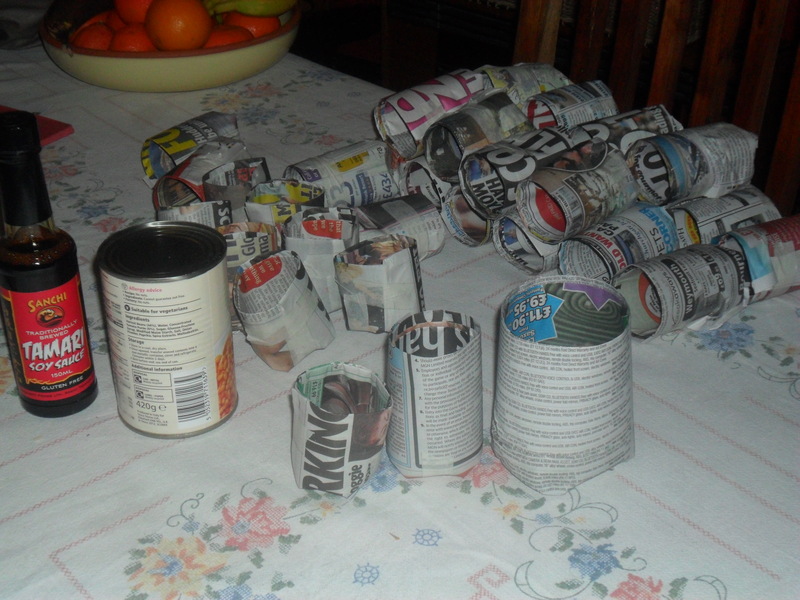 Newspaper pots are great to make as they are extremely cheap and environmetally friendly to use, as the recycled materials decompose when you put them in the ground. 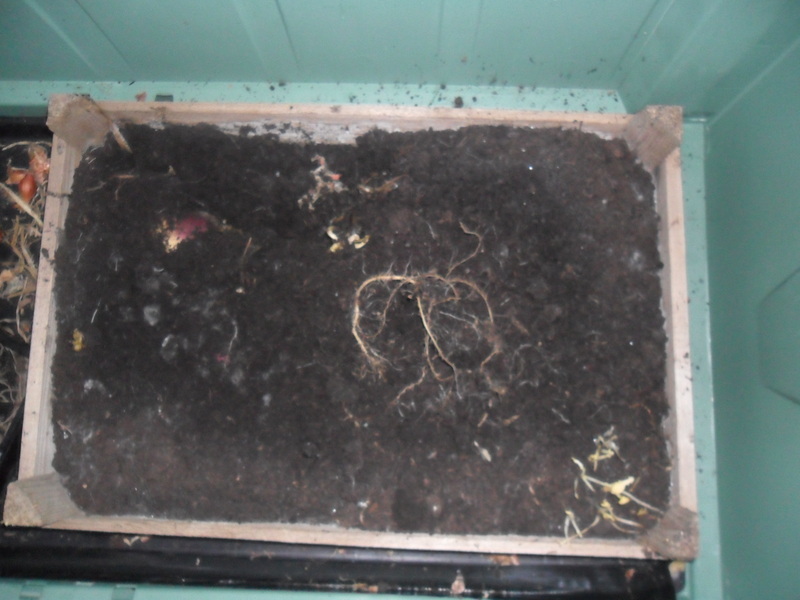 This also helps the plants that do not like root disturbance, e.g. 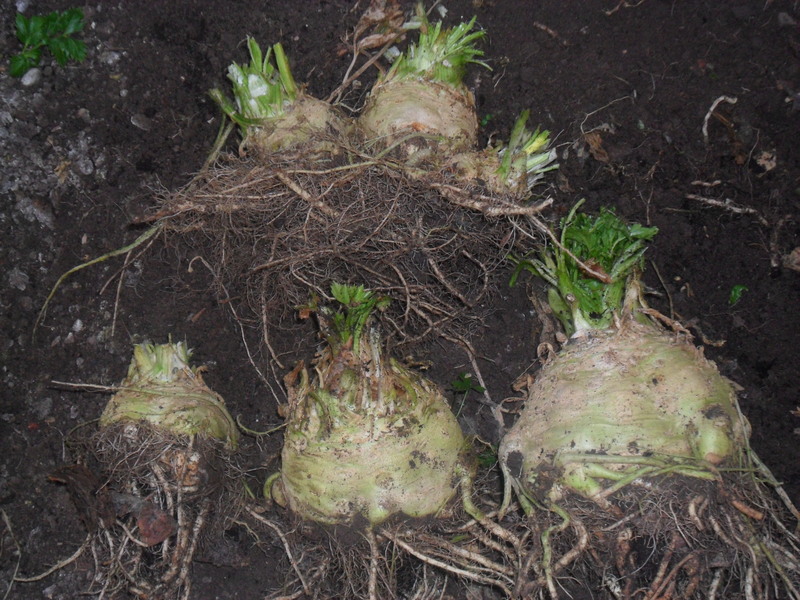 swedes, that can be sown in the pots and then planted a few weeks later, still in the newspaper pots. 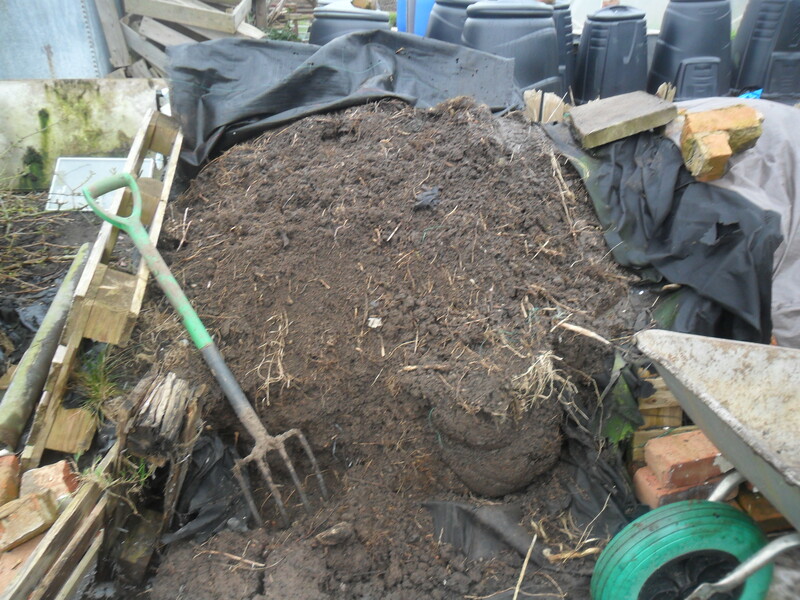 The plants find it easy to grow their roots through the damp pots when they are in the ground. 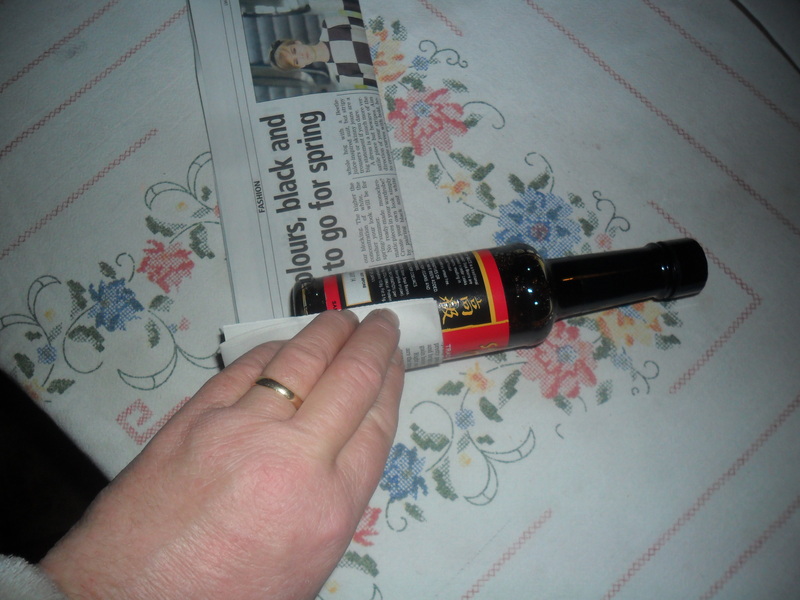 Ensure you don’t roll the newspaper too tightly, or it will be hard to remove the paper from the bottle. 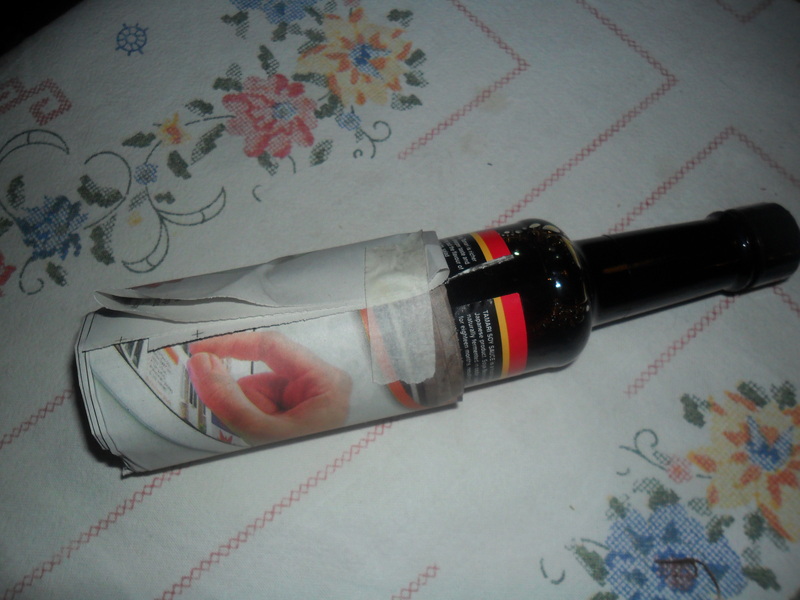 Use a small piece of masking tape to secure the paper at the top and then fold in the newspaper over the bottom of the bottle. 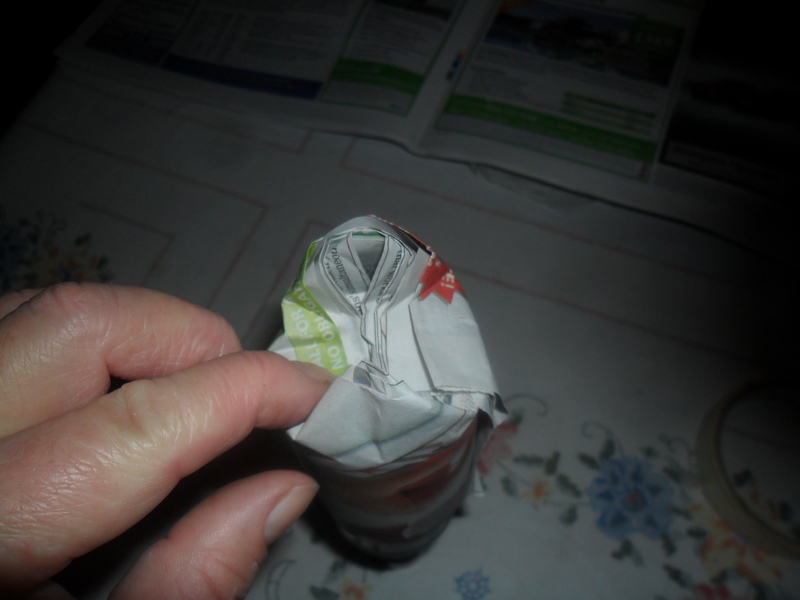 Secure the bottom of the pot with a small piece of masking tape. 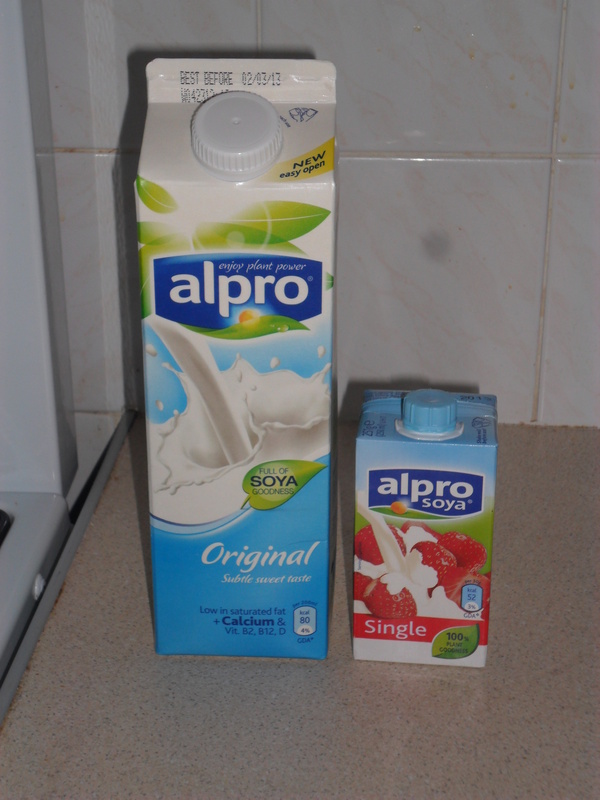 You can use different sized tins and bottles depending on the size of pot required. 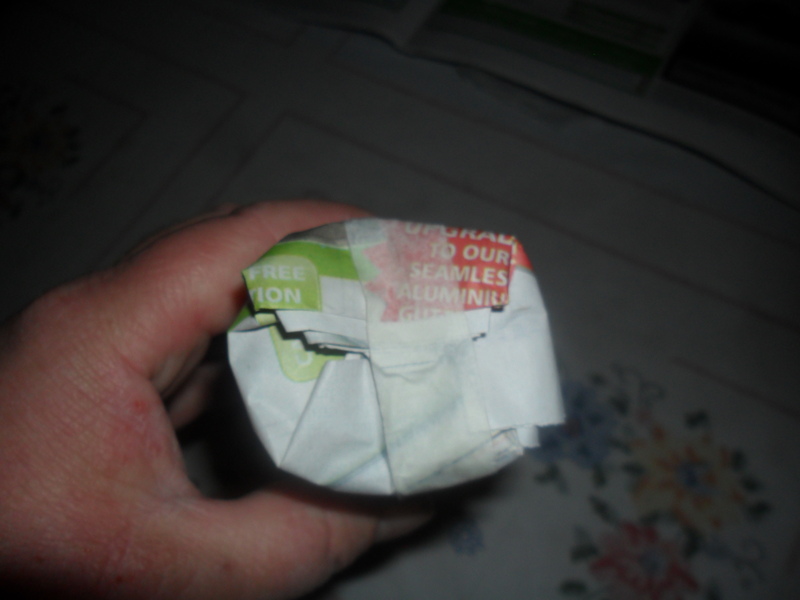 For example, I use a baked bean tin to make pots ready for when I ‘prick out’ my tomato plants. I find it’s best to make the pots and use them straight away, as sometimes the masking tape becomes ‘unstuck’ if you make them too far in advance. Also, when your plant is ready to go into the ground, make sure all of the newspaper is under the soil, or the paper will act like a wick and dry the compost out. I’ll be back on Friday at approximately 6 pm. 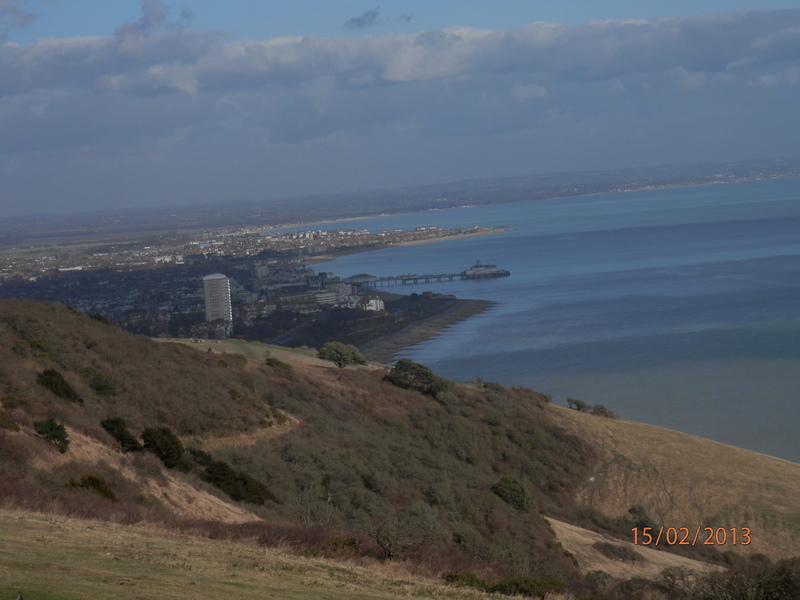 Last week it was ‘half term’ for children in Leicester, so we went to Eastbourne for a week. 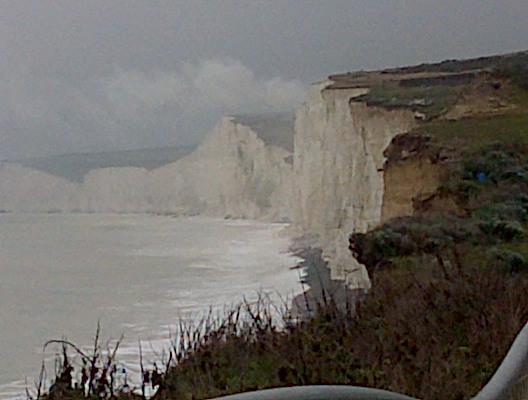 We nearly didn’t go, as it was the funeral of my good friend on the Wednesday. 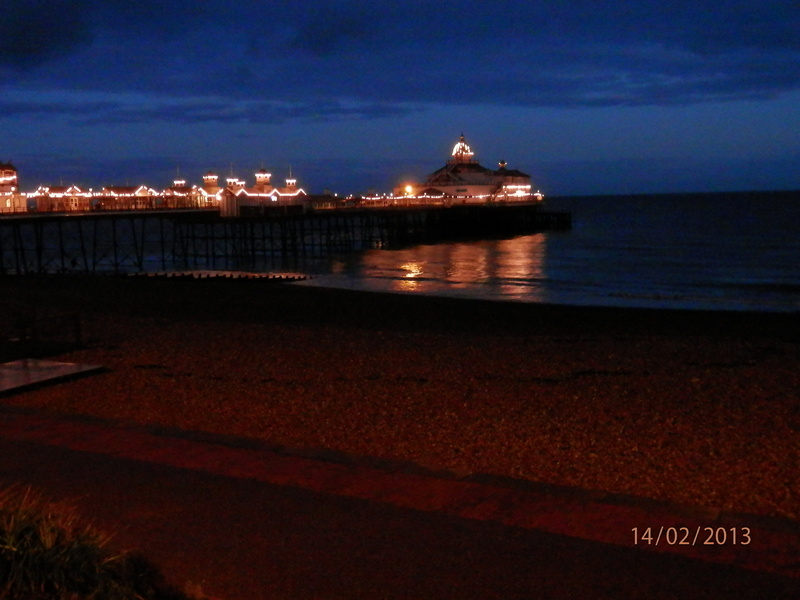 We didn’t want to miss the funeral or the holiday, so we traveled back on Tuesday evening and then traveled back to Eastbourne on Wednesday. The funeral was beautiful and so so sad. 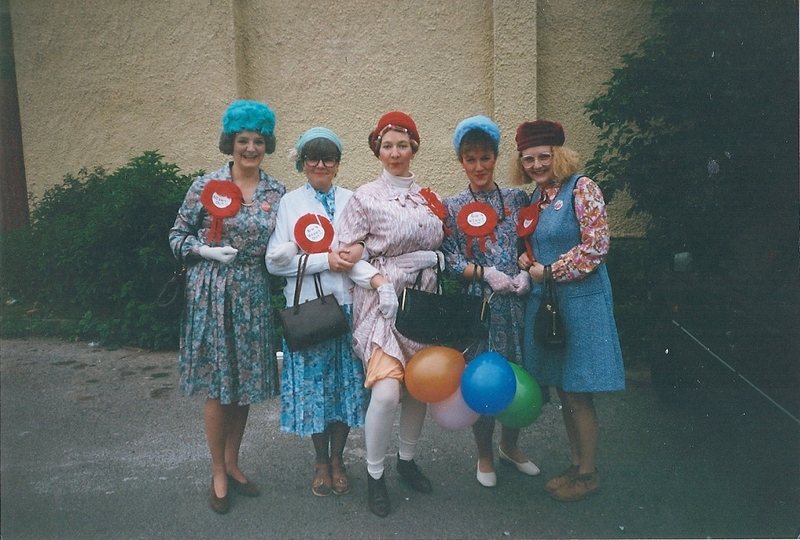 There must have been about two hundred people there, which showed how well she was thought of by everyone. When we came out of the funeral, it snowed really heavily, it was so pretty and I know she would have loved it. I will remember my friend each time it snows now. 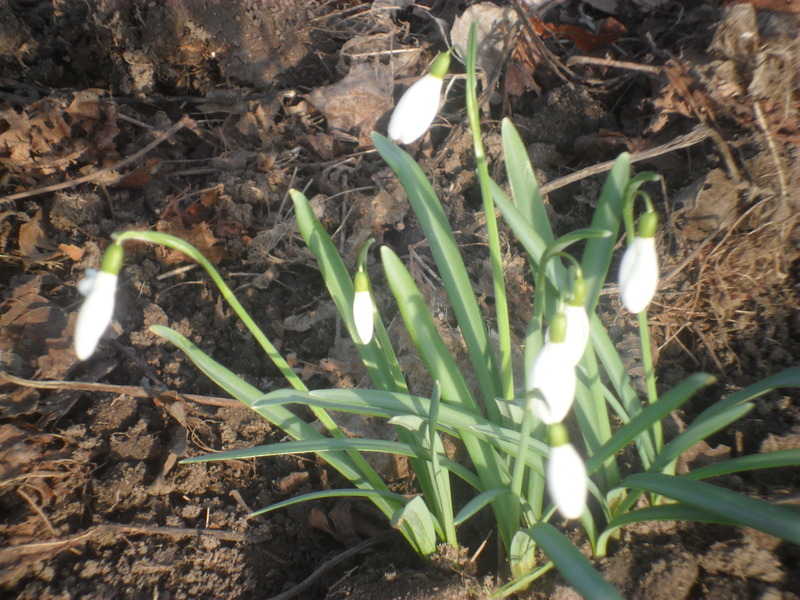 The day after she died, I noticed lots of snowdrops were in flower, as I went for a walk with my husband. 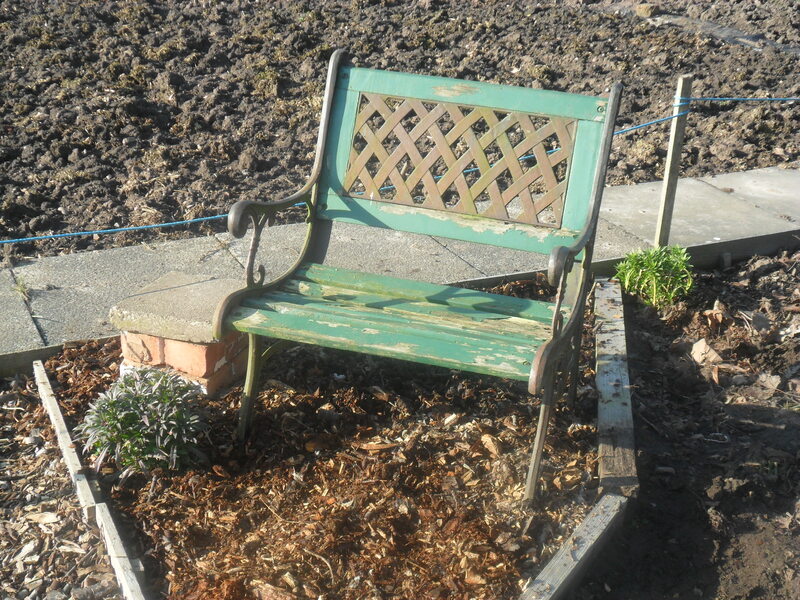 So I have decided to plant lots of snowdrops this year in my new woodland patch at my allotment, as a way to remember my friend. 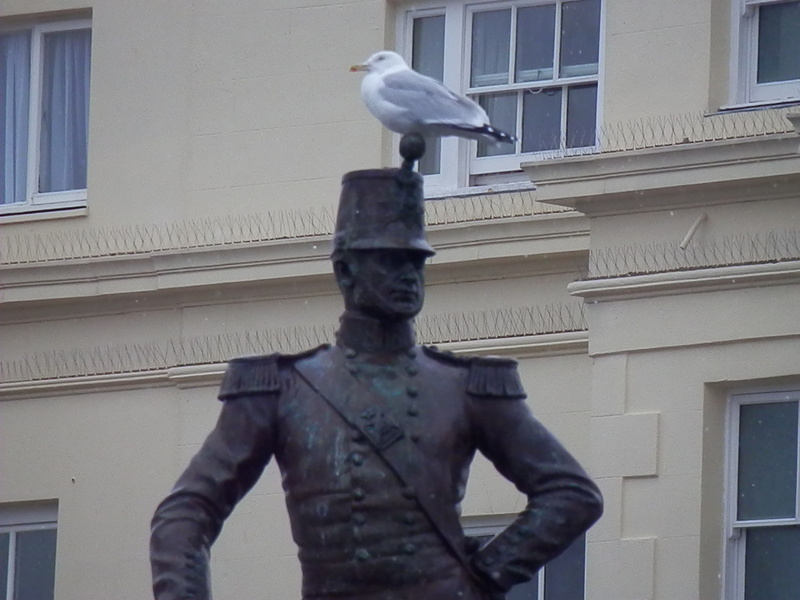 Eastbourne was lovely, as usual. 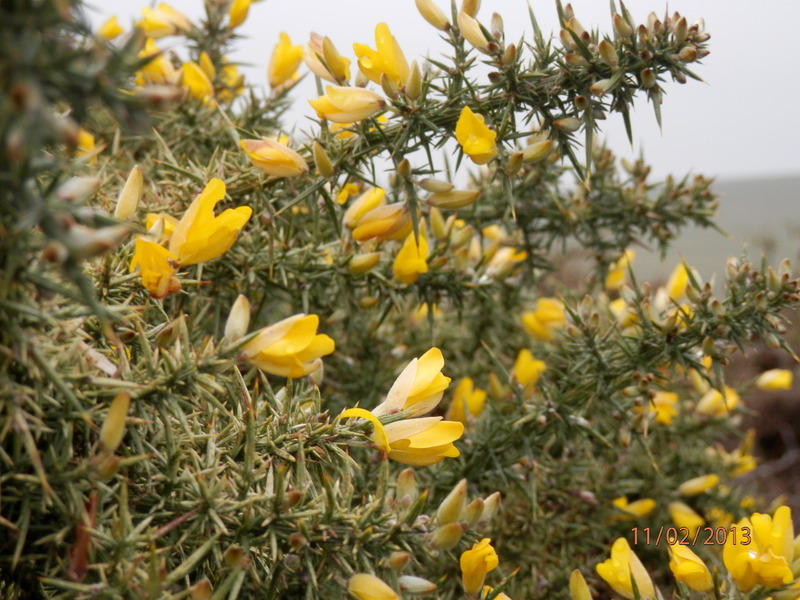 It was rainy and wet when we arrived and the wind was blowing a gale, but this soon passed and we had a couple of beautiful days where the sun shone. 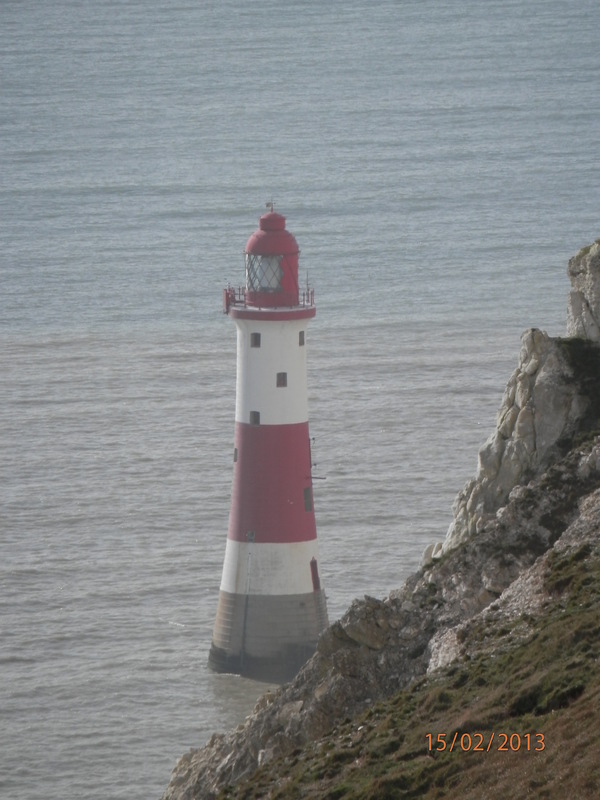 We stayed in the Travelodge that is just across the road from the sea and yet again we only paid £31 per night for bed and breakfast for a family of four. 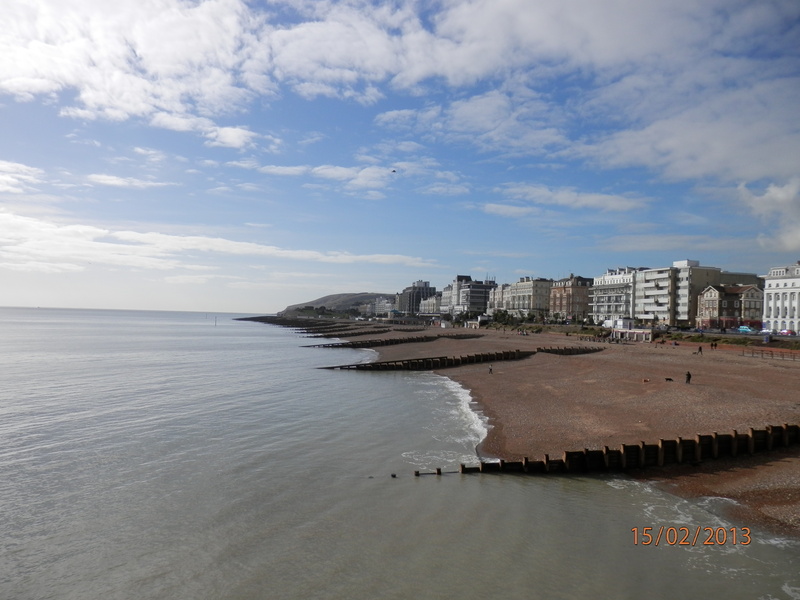 You can read about the Travelodge, room and breakfast on a post I wrote here. We had a lovely, peaceful holiday. 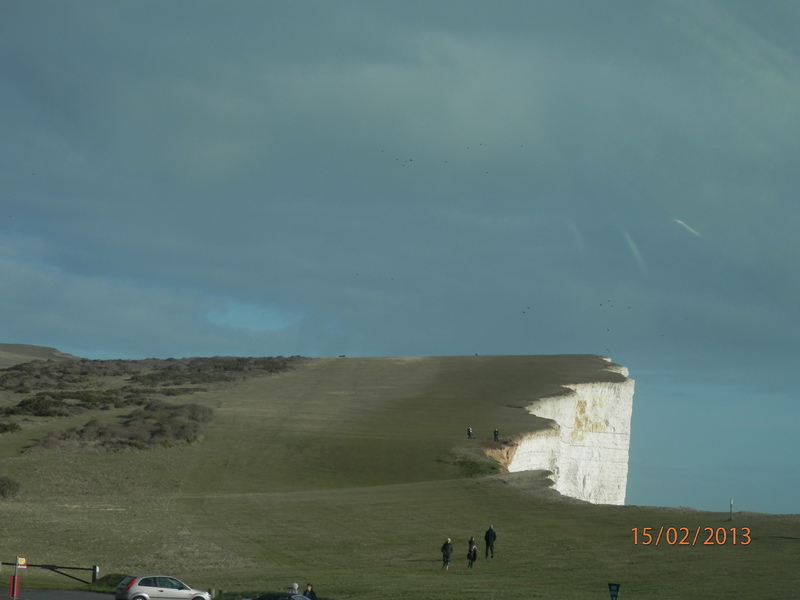 While we were there it was my eldest daughter’s birthday. I can’t believe she is 15 years old! 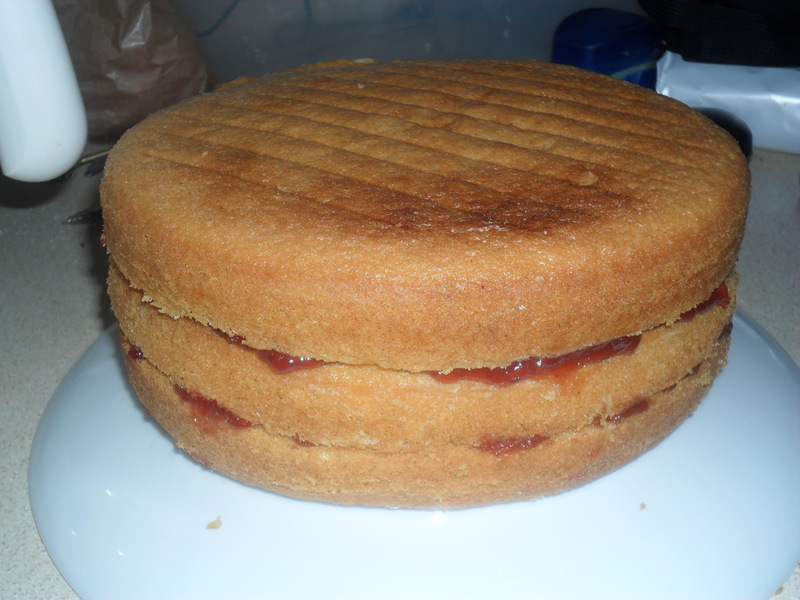 First I made three sponge layers, using the easy sponge cake recipe here, and sandwiched them together using a nice homemade Strawberry Jam. 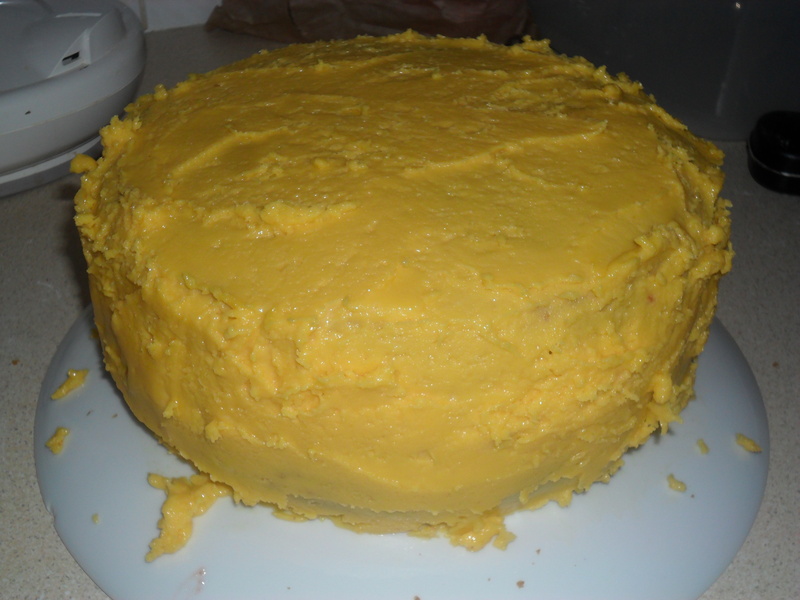 I then made up some butter icing, with a tiny bit of yellow sugar paste (my daughter’s favourite colour). 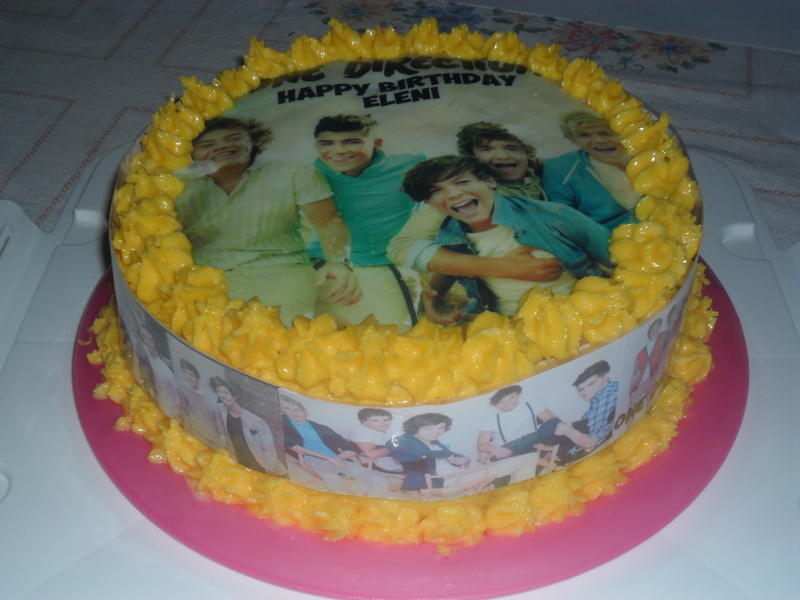 You can see how to make the buttercream here. My daughter loved the cake especially as the cake had her name on. My homemade cake was bigger than the Tesco version you can buy for £8 and I made it ‘dairyfree’ so all my family could enjoy it. 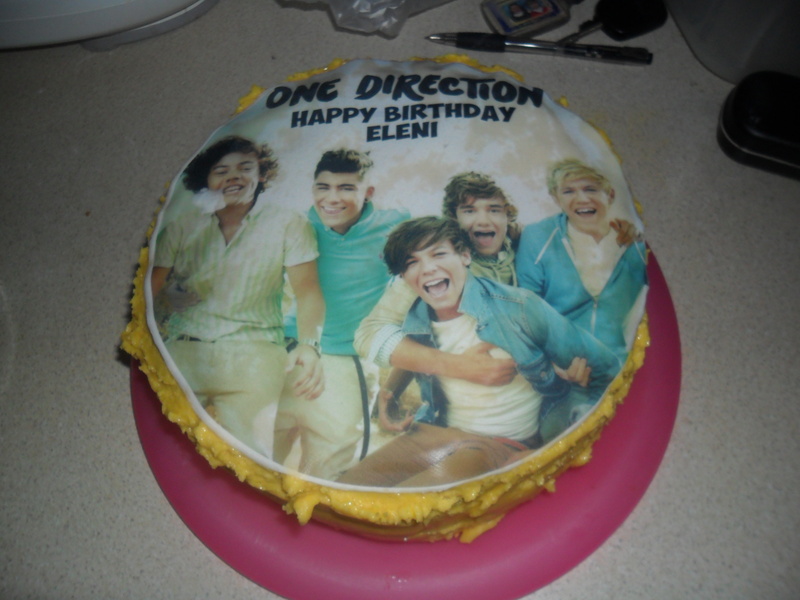 I would like to bet that a homemade cake tasted better too. 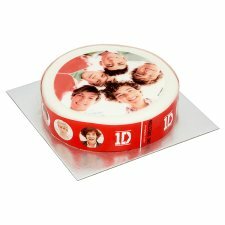 We couldn’t put candles on the cake, as it would have set off the smoke alarms at the Travelodge, but we sang ‘Happy Birthday’ to my daughter and the staff who were working that evening joined in too and also shared the cake with us. I will be back again on Friday. 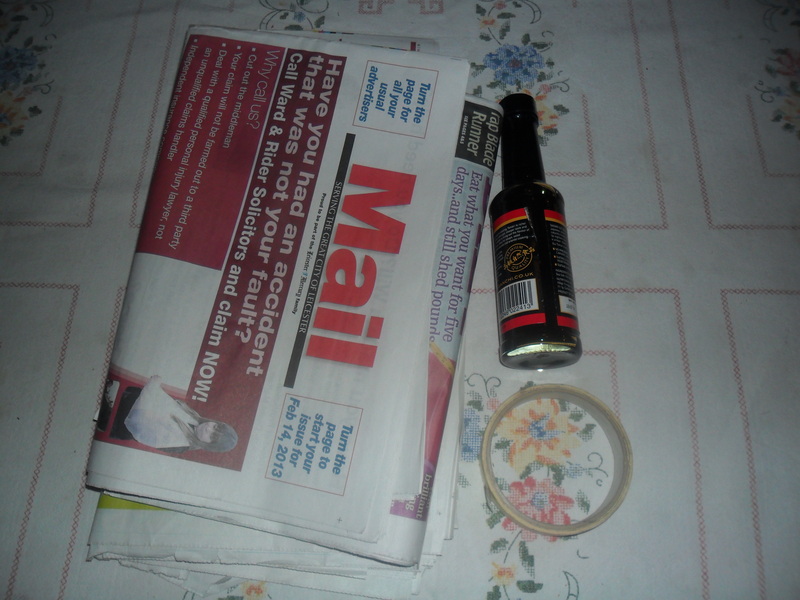 My weekend has been pretty hectic as usual. I started the weekend by batch baking for the week ahead. 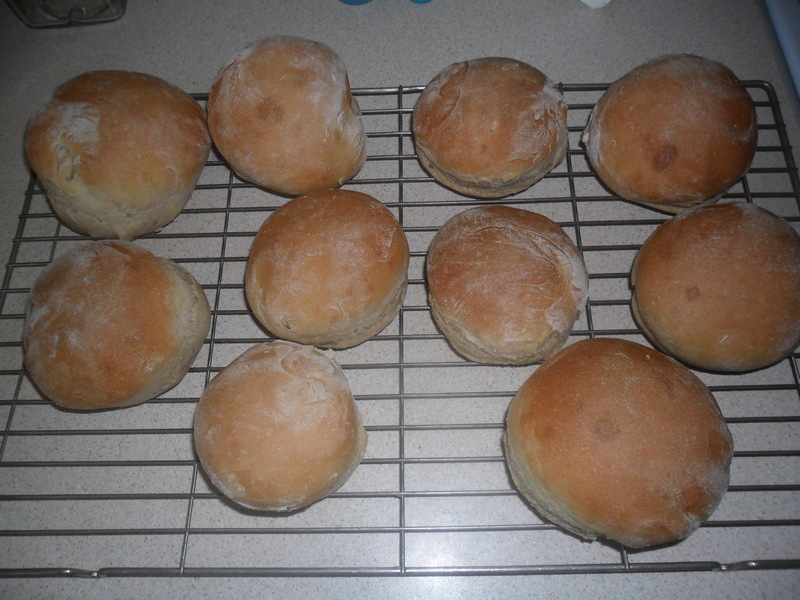 I made bread rolls. scones, chocolate brownies and some more breakfast muffins, all ready to freeze for packed lunches over the next week. I also laid some self-adesive tiles in our cupboard under our stairs. 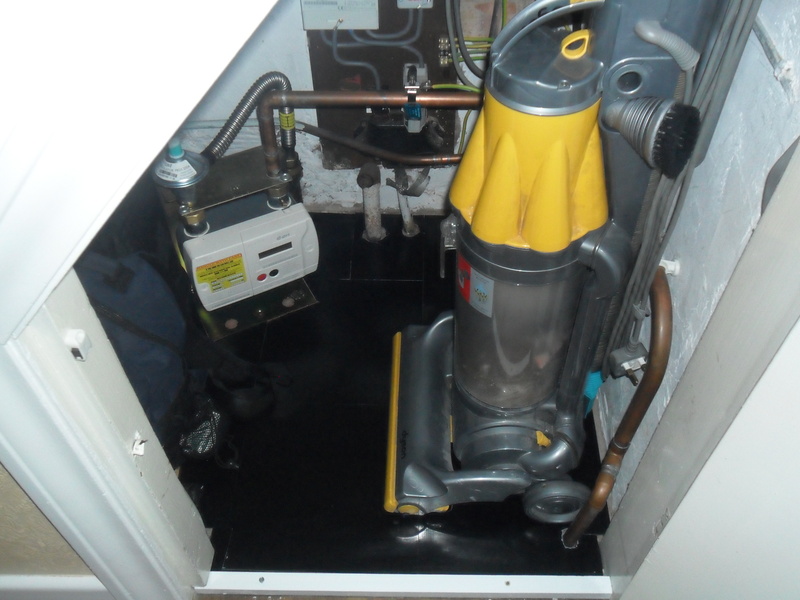 After finishing my painting last week, this was the last job to do, as the floor was bare wooden floorboards. It was the first time I had laid tiles and I am really pleased with the result, though I found cutting them around the pipes difficult. 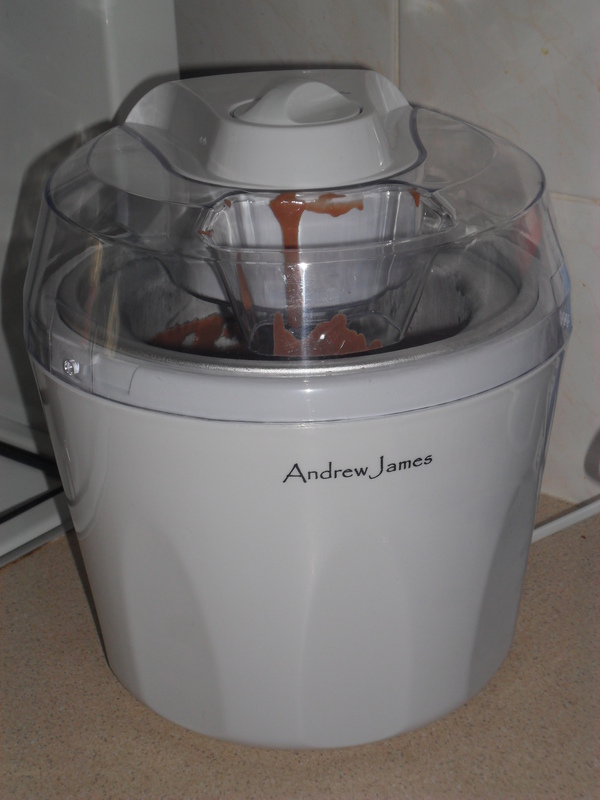 This weekend I also used my ice cream maker for the first time. I have been paying over £6 for a small tub of dairy free choclate ice cream, as it’s such a treat for my daughter. 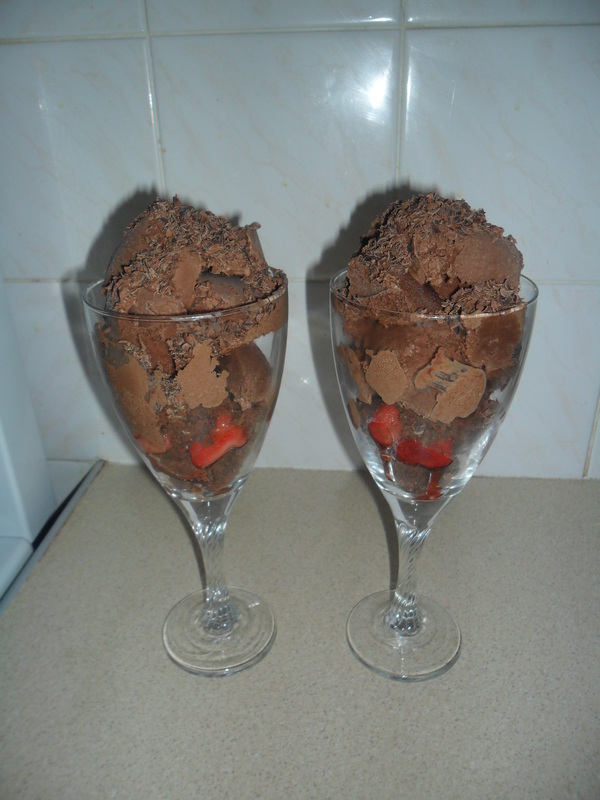 This weekend I found this recipe and altered it slightly to make the most delious, tastiest luxury chocolate ice cream I have ever tasted and the best bit is, it cost me just £3.92 to make. 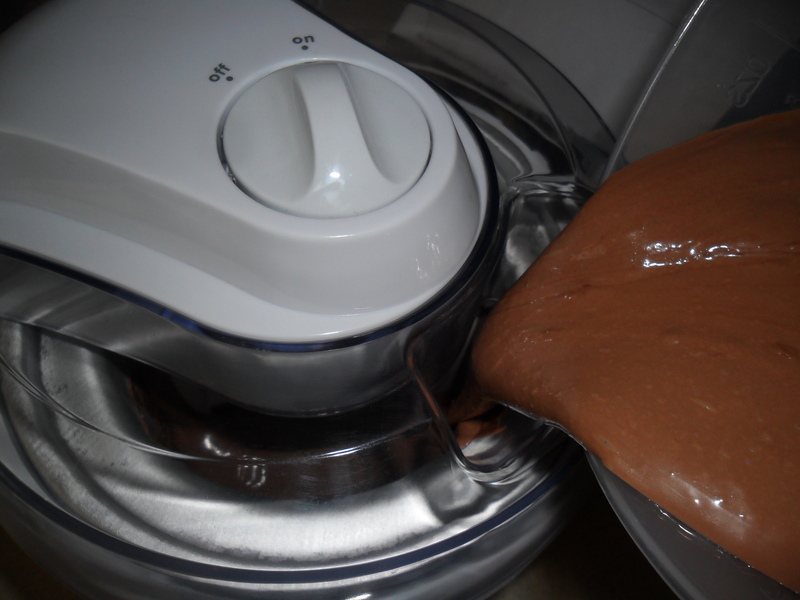 Refer to your ice cream maker for timings and how much to fill the bowl. 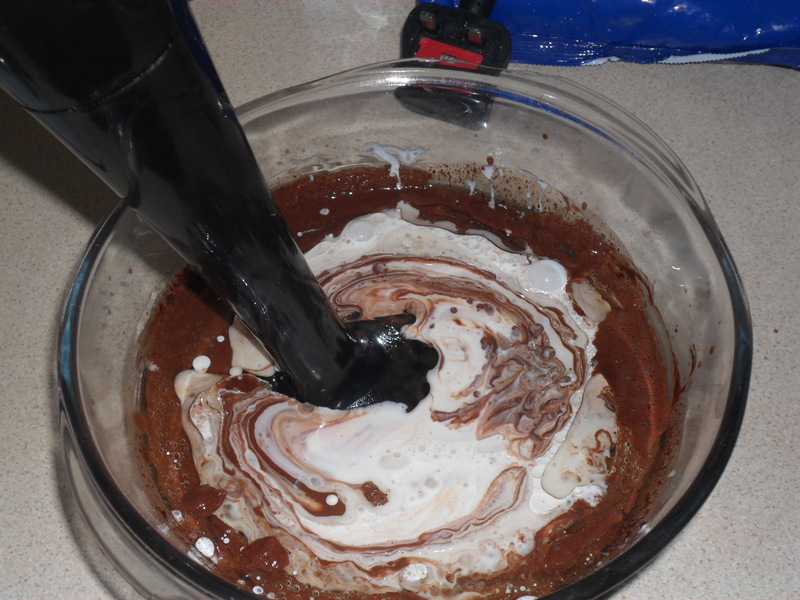 I let mine beat the mixture for 30 minutes. 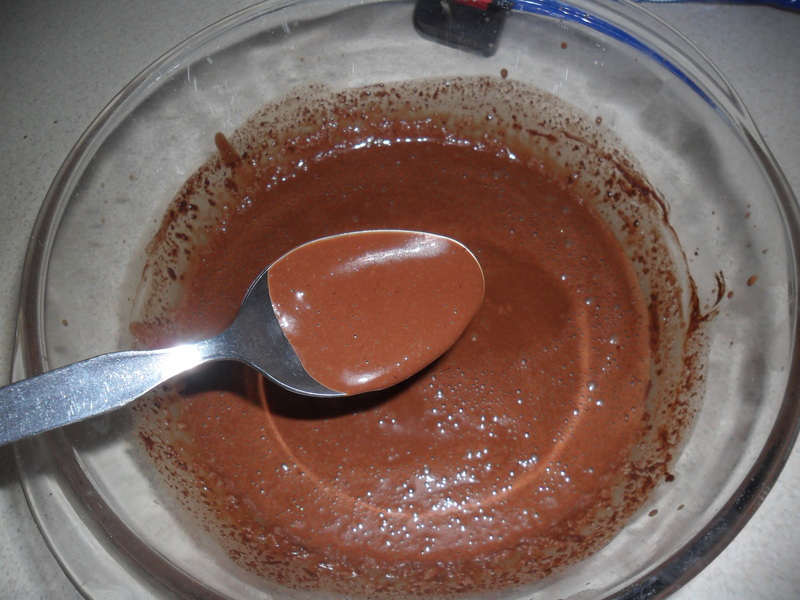 Transfer the ice cream to a suitable container and freeze for a few hours until completely solid and then enjoy. 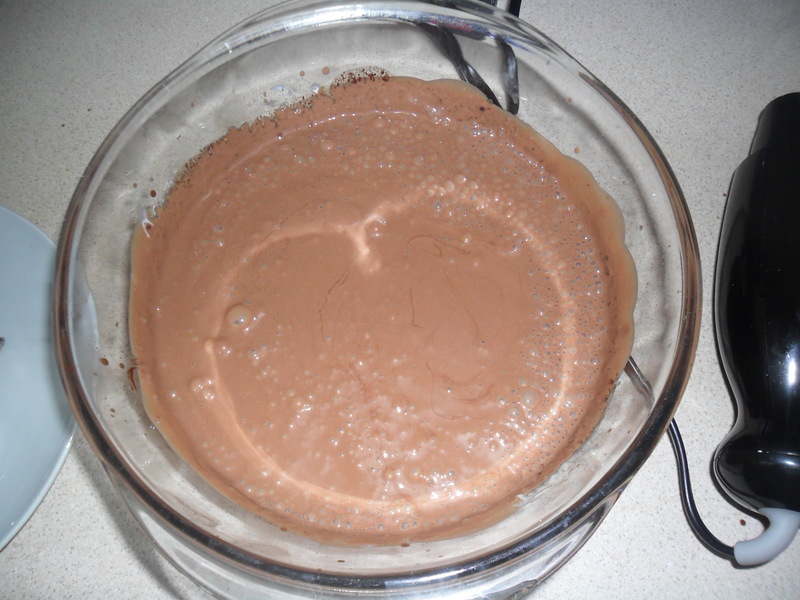 (If you haven’t got an ice cream maker, just put the blended ingrediants into a container and freeze. Remove from the freezer every 1-2 hours and mash vigourously with a fork to break up the ice crystals). I made ice cream sundaes with the ice cream. 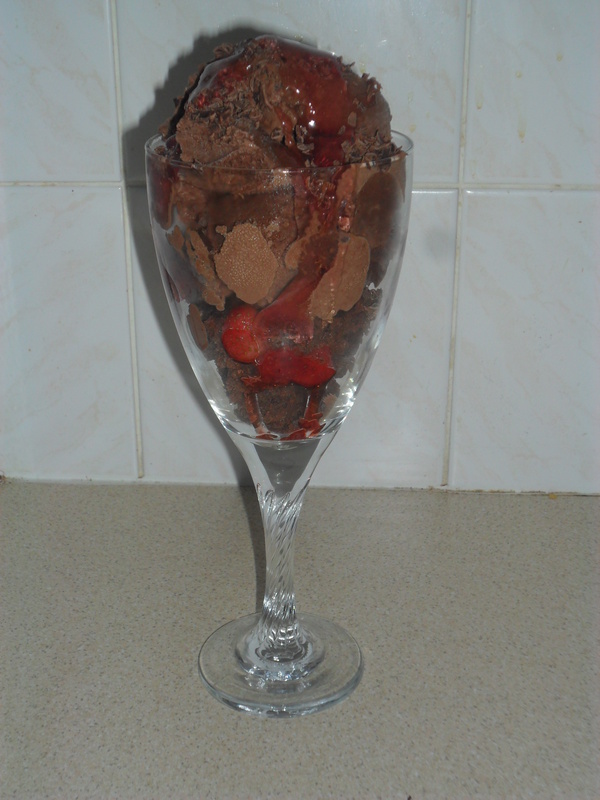 I broke some of the homemade chocolate brownies into the bottom of a large glass and added some defrosted homegrown strawberries from my freezer and then the ice cream. I topped it with gratings of dairy free chocolate and my homemade crab apple ice cream syrup….sheer bliss and my daughters loved it. 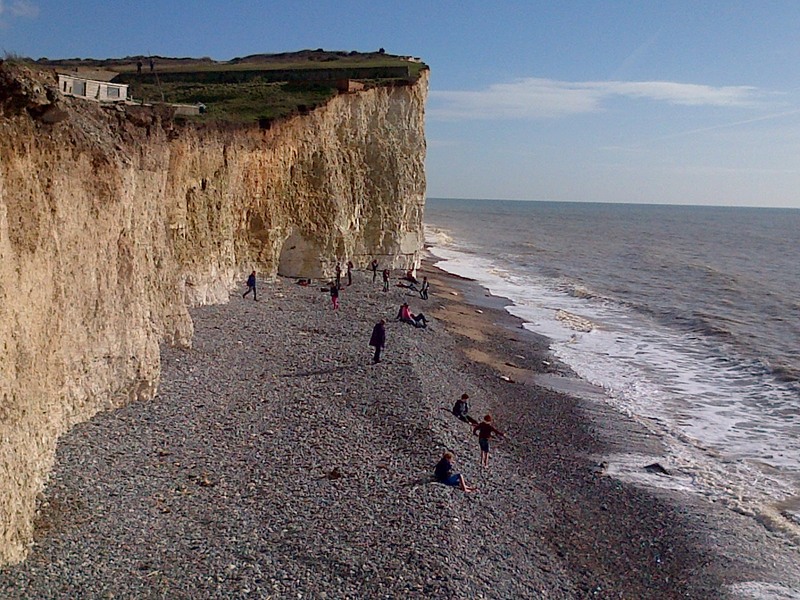 It is half term for all the children in Leicester next week, so I have decided to take the week off. I will be back on Monday 18th February. 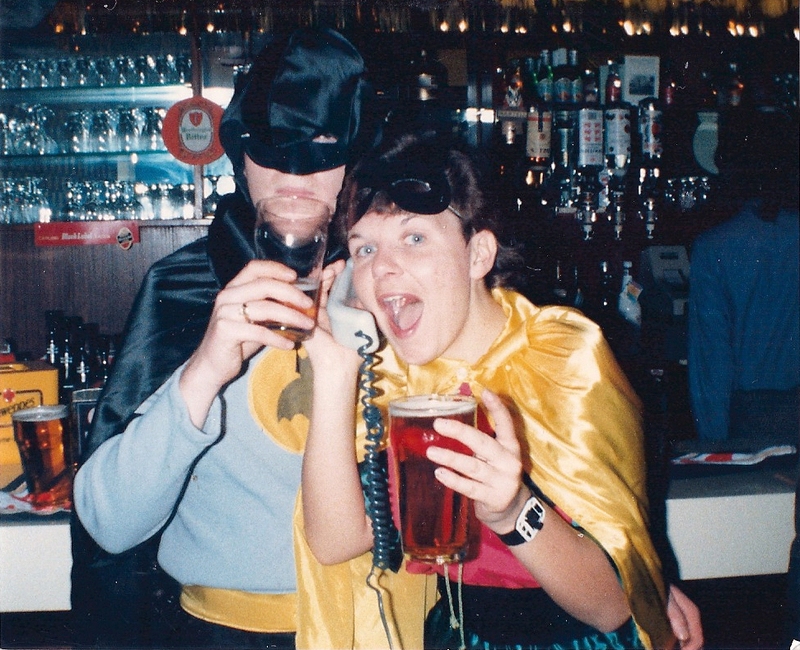 How do you lose a friend you have known nearly all your adult life? This isn’t the post I was planning on writing today. It’s 4am and I have hardly slept all night. I’m not sure why I’m writing this, but I have words and memories running around my head, I suppose this is just grief setting in. Less than twenty four hours ago, I had the phone call that I had been dreading, but expecting. 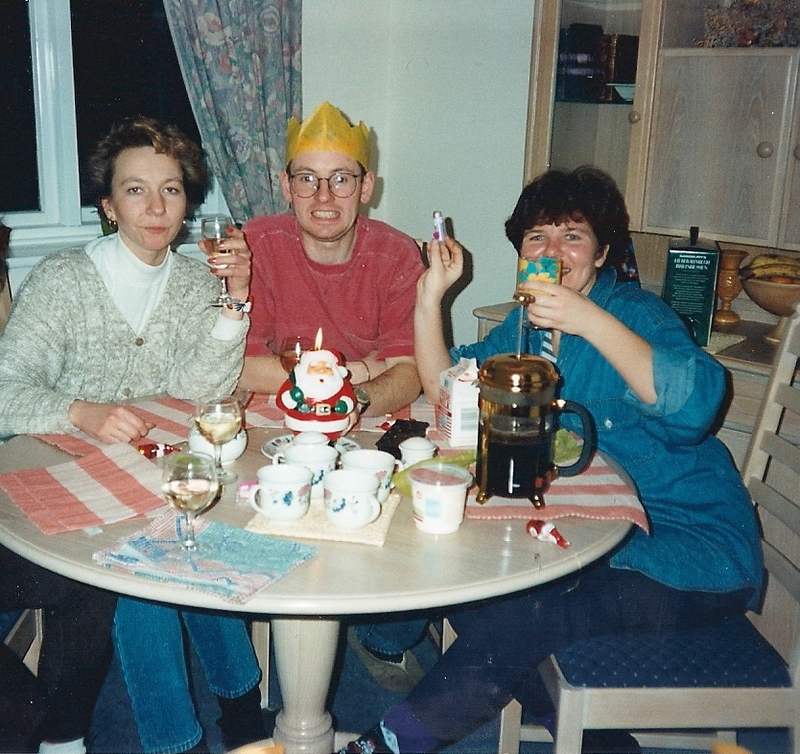 My good friend Helen, took her last breath at 8.30am yesterday and quietly passed away. She had been battling with a brain tumour for nearly four years and finally it had won. Yesterday I felt like my world has stopped and I was just watching everyone around me. I suppose I was in shock, even though I knew it was coming. I have never felt as empty as I did yesterday. For weeks I had tried so hard to be strong when I sat with her, but on my last visit I cried, I knew that we would soon lose her. Her husband was so fantastic with her the whole time. 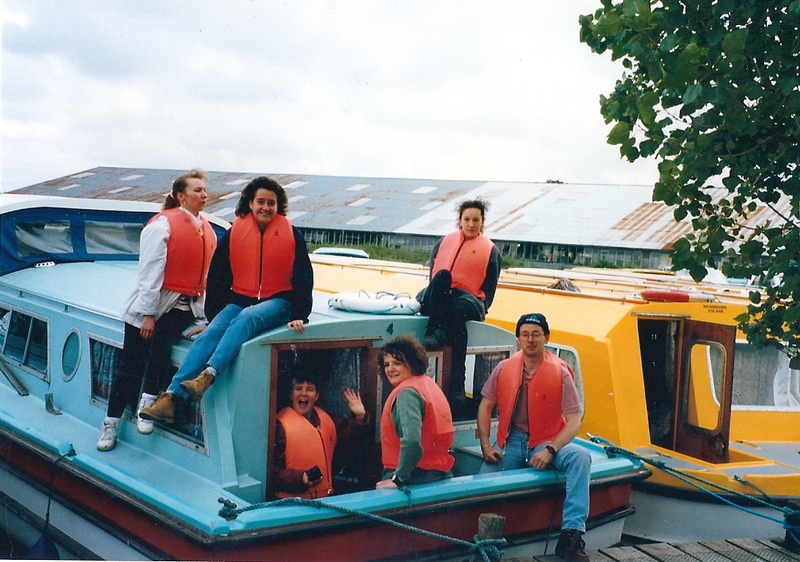 She wanted to be at home for as long as she could, to be with her family and friends. This was only possible because her husband had cared for her so brilliantly, right up until the end. Home is where she died. I know everyone always have nice things to say about people that have passed away, but she really was the kindest, most thoughtful person I have ever met. 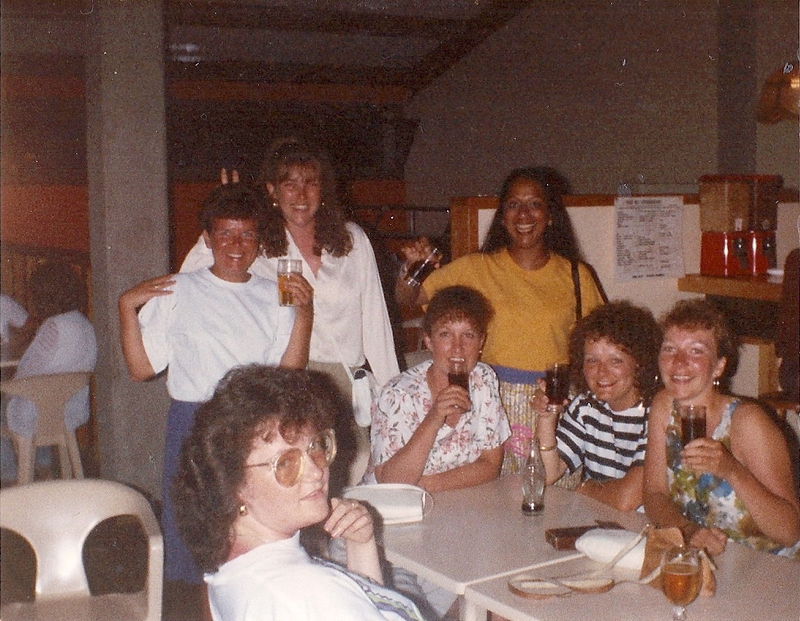 Over the years, I have so many wonderful memories of places we have been to, holidays we have shared and nights out I will never forget. Sometimes I would laugh so hard with her, I cried. We had so much fun. She was always such a loyal and good friend to everyone she knew. She was a fantastic mother, with two children aged just 15 and 18 years old, my heart goes out to them. On my last visit I told her that she should be really proud of herself, as her children have grown up to be a credit to her and her husband, I hope she heard me. 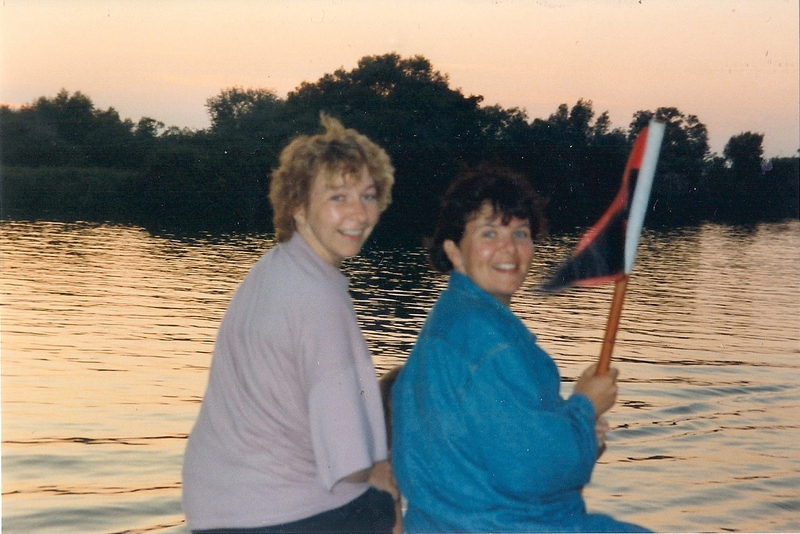 So how do you carry on when you have lost a good friend that you have known for more than 28 years, nearly all of your adult life? I just don’t know. I feel angry that she has been cheated out of life so early and I have feelings of guilt running around my head, that it was her and not me. However, I am old enough and wise enough to know, that how I feel now is only natural and the pain will pass in time and I will be left with lots of happy memories. 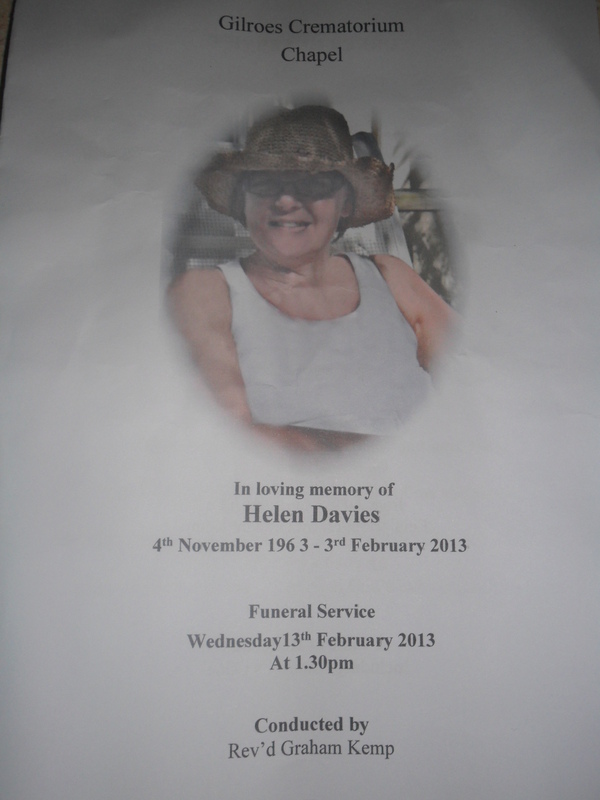 My thoughts are with your husband and children Helen, God bless you. 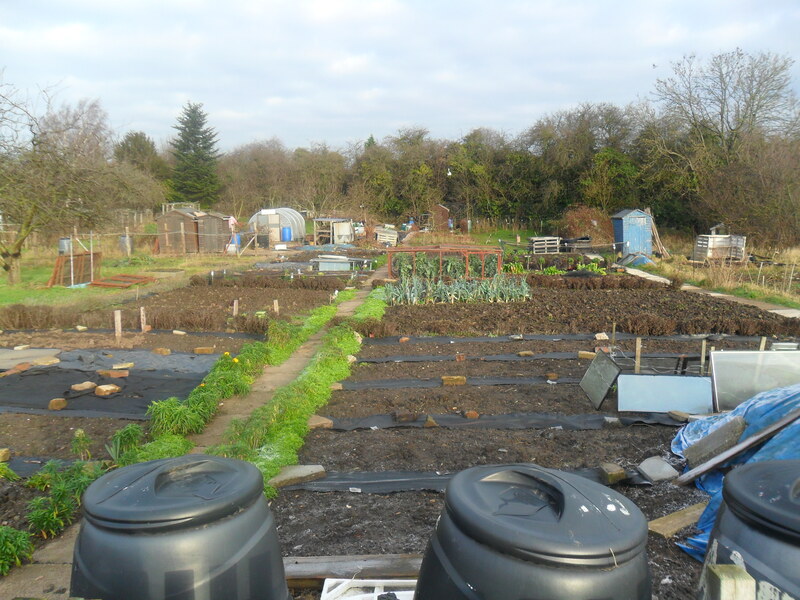 Brussels, kale, cabbages, parsnips, celeriac, leeks, cauliflowers, swedes, Jerusalem artichokes, hardy lettuces, corn salad, land cress and winter purslane, mizuna, early sprouting broccoli. 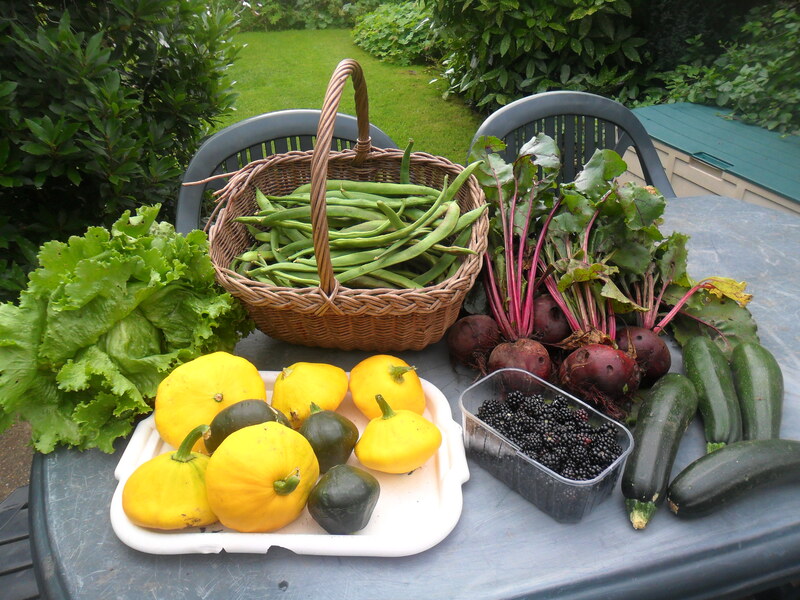 Broad beans can be sown outside if the soil is not frozen or waterlogged. 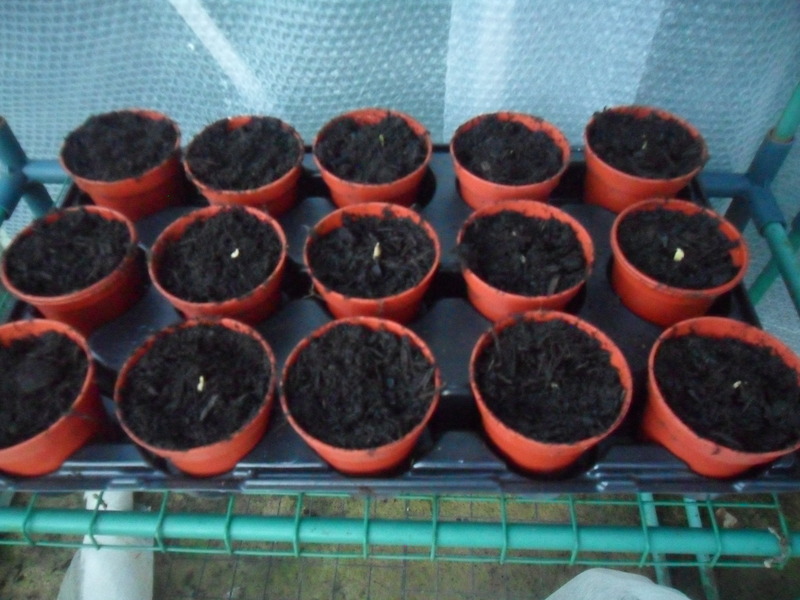 Hardy peas can be planted outside in milder areas or undercover. Onions can be grown from seed in modules, but they must have a minimum temperature of 10C. 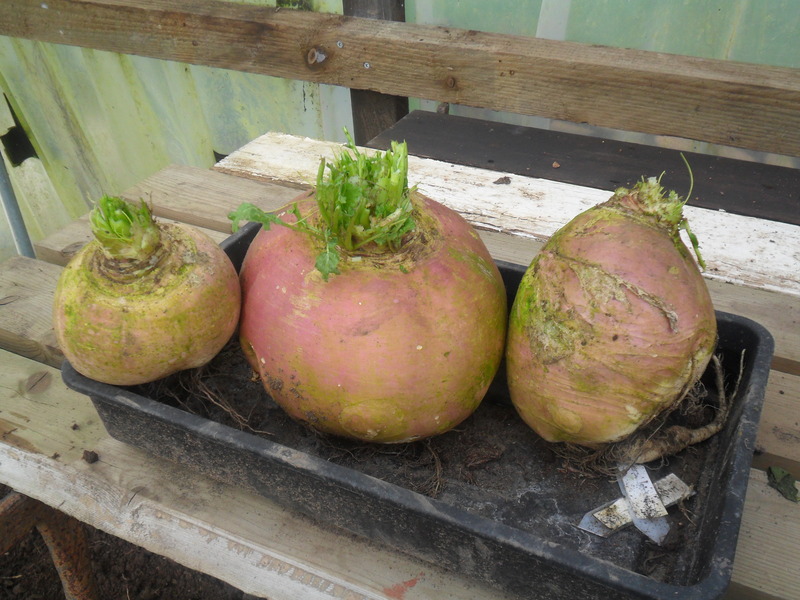 Early varieties of Kohl rabi, brussel sprouts and sprouting broccoli can be sown this month indoors and Globe artichokes, lettuce, leeks, radish, coriander, basil, spinach and greenhouse tomatoes and cucumbers too. Garlic can be planted outside. 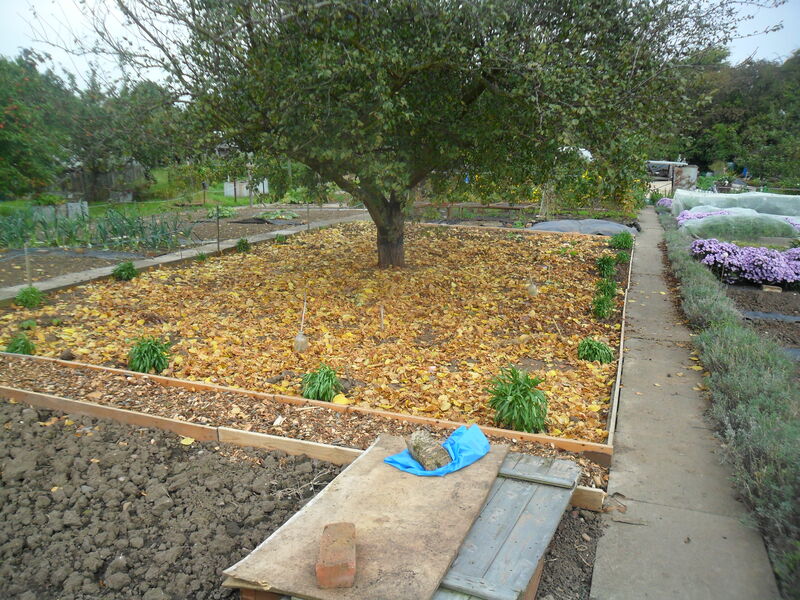 Bare-rooted fruit trees and bushes can be planted. 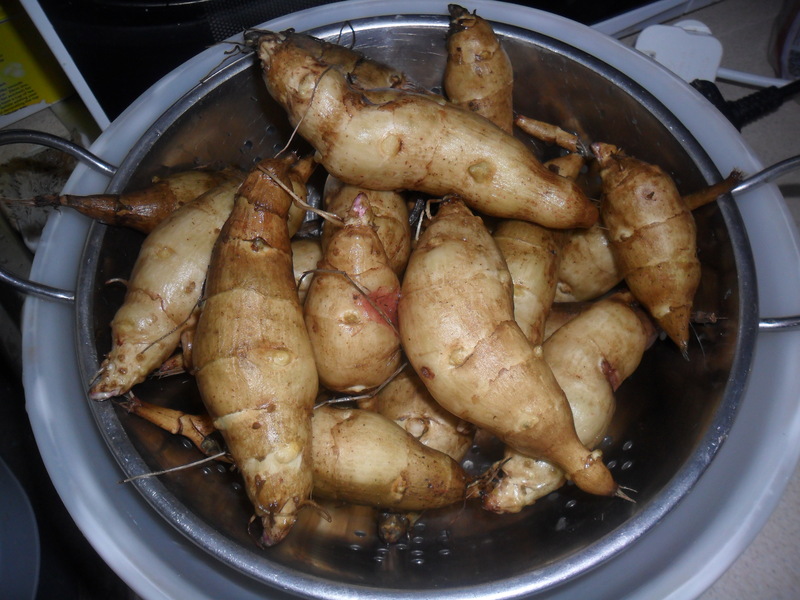 Jerusalem artichokes can be dug up and re-planted and rhubarb sets can also be planted this month. 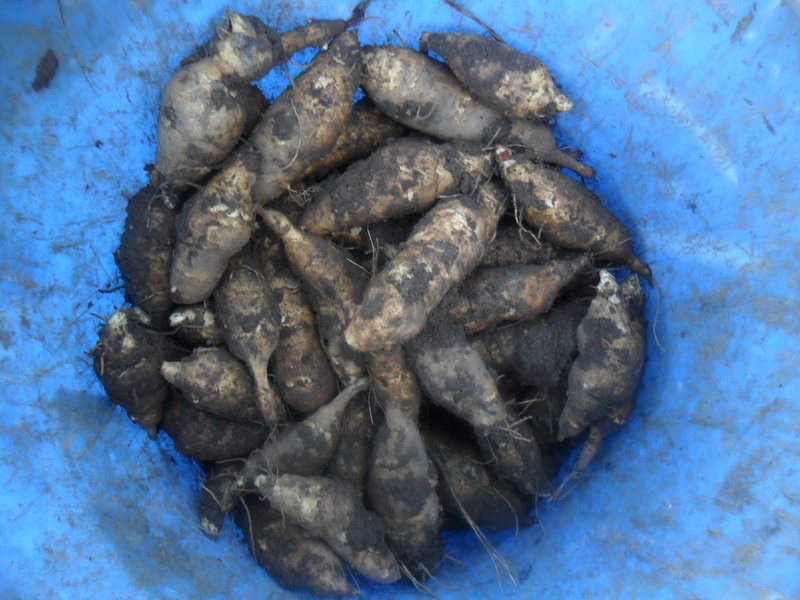 Lift your remaining Jerusalem artichokes and dig in some compost or manure. 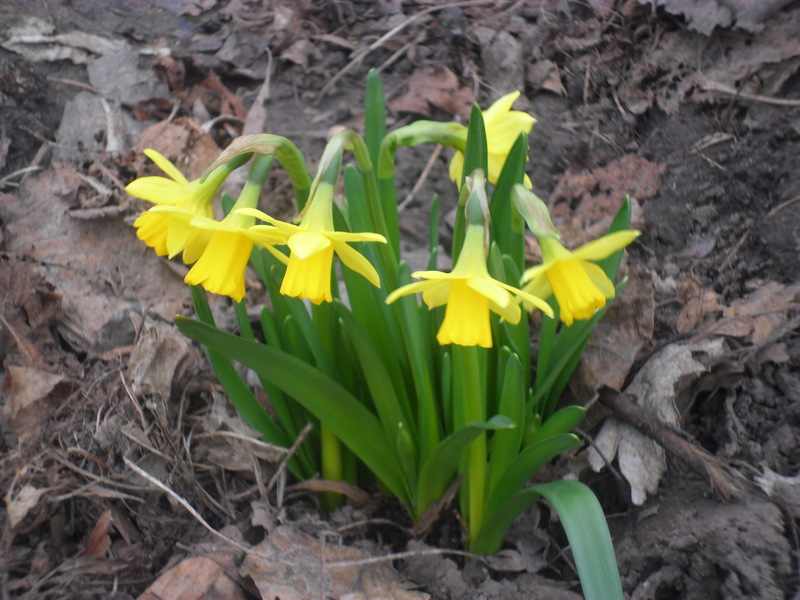 Replant them 10-15cm deep, 30-40cm apart. 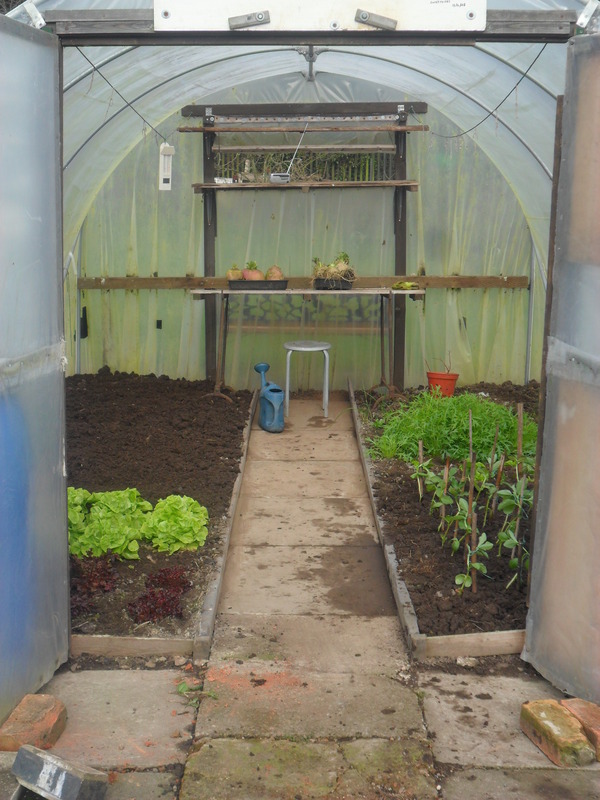 Warm the soil where you will be soon planting crops e.g. 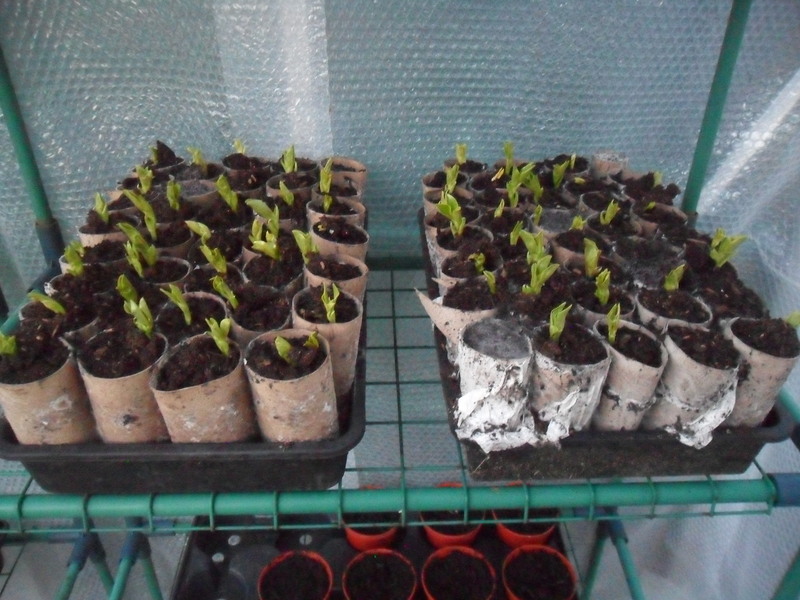 broad beans or shallots, by covering with plastic or cardboard. Continue to plant bare-rooted trees and fruit bushes. 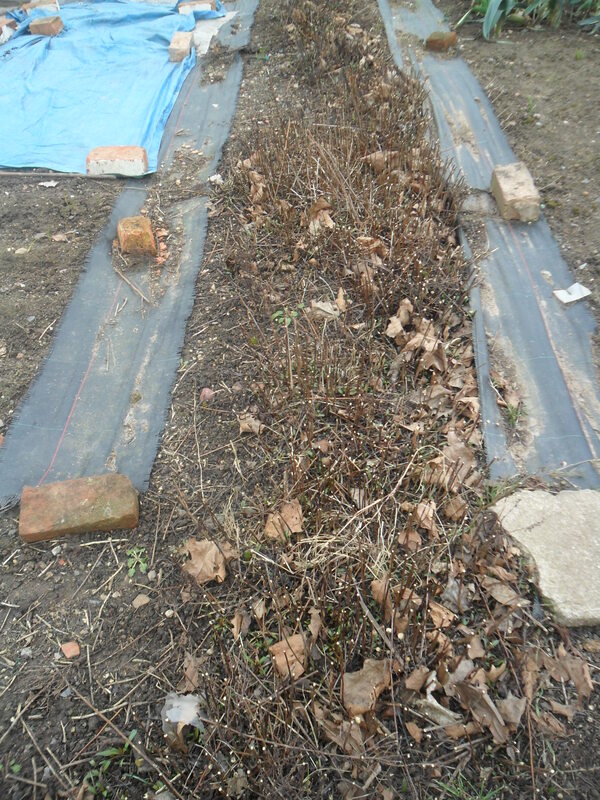 Cut down autumn raspberries to just above ground level, as they produce fruit on new growth during the summer. 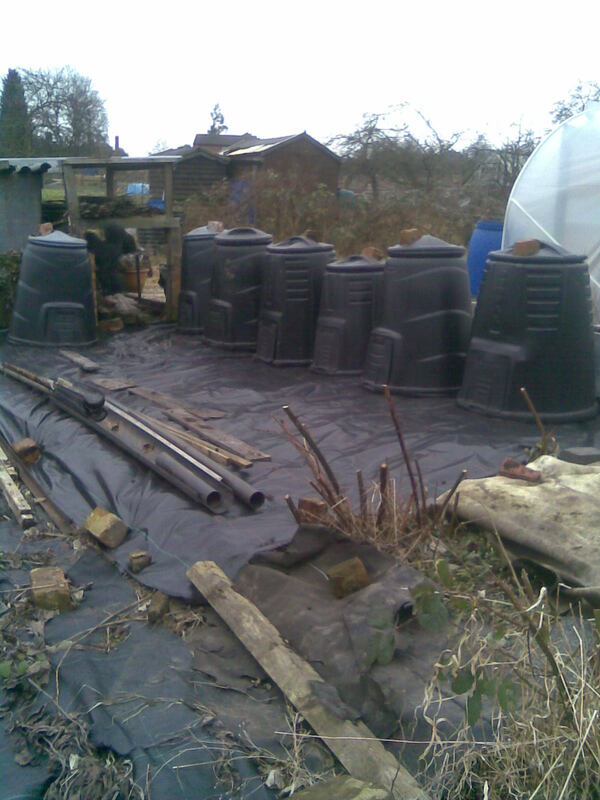 Give your compost heap a turn and water it if it is dry. 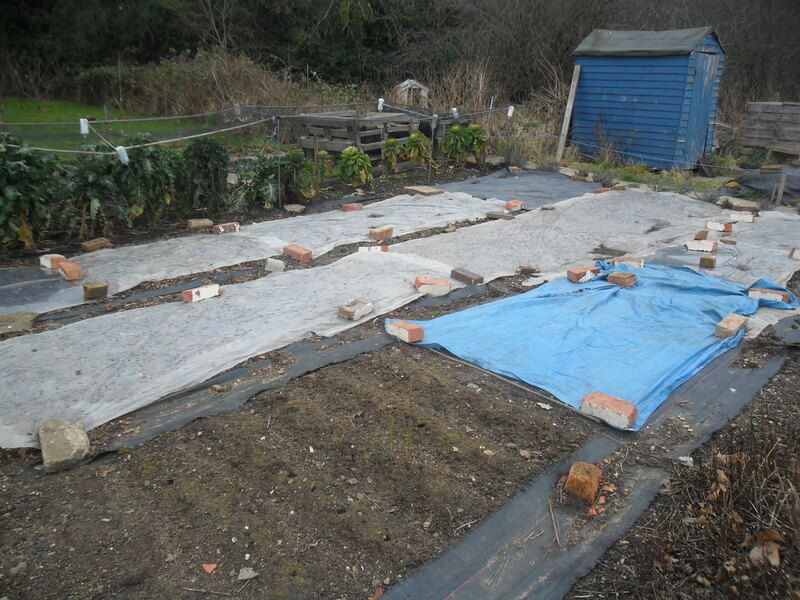 Finish digging your plot over if it is not waterlogged or frozen. 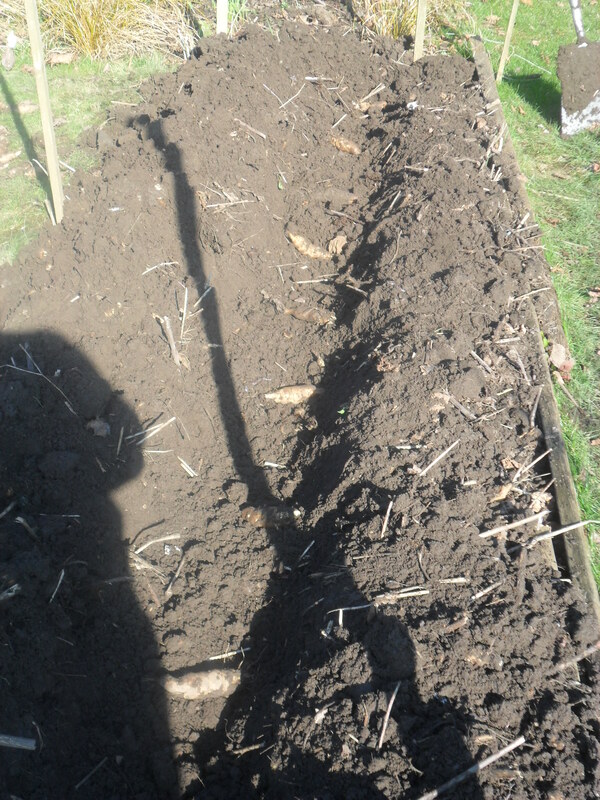 If it is just a little bit wet, use a plank to stand on while you dig, to spread your weight evenly. 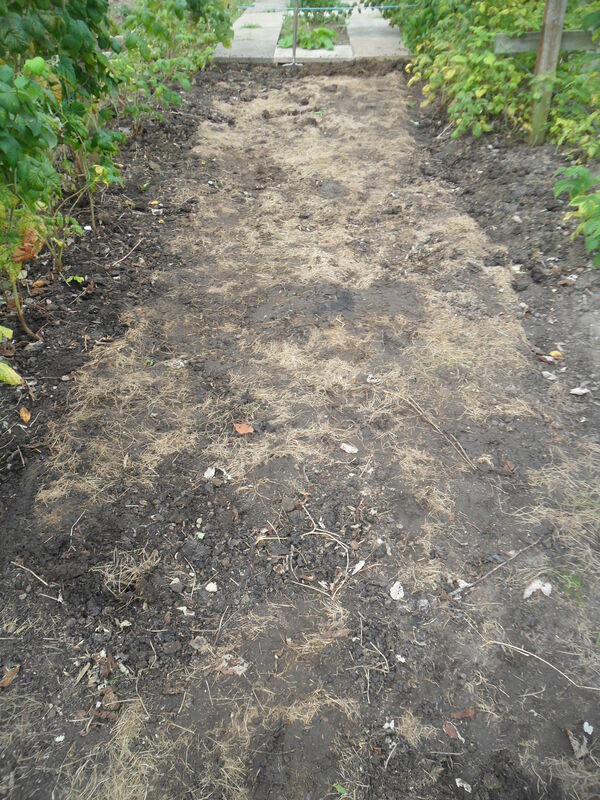 Continue to fill your runner bean trenches with old peelings. 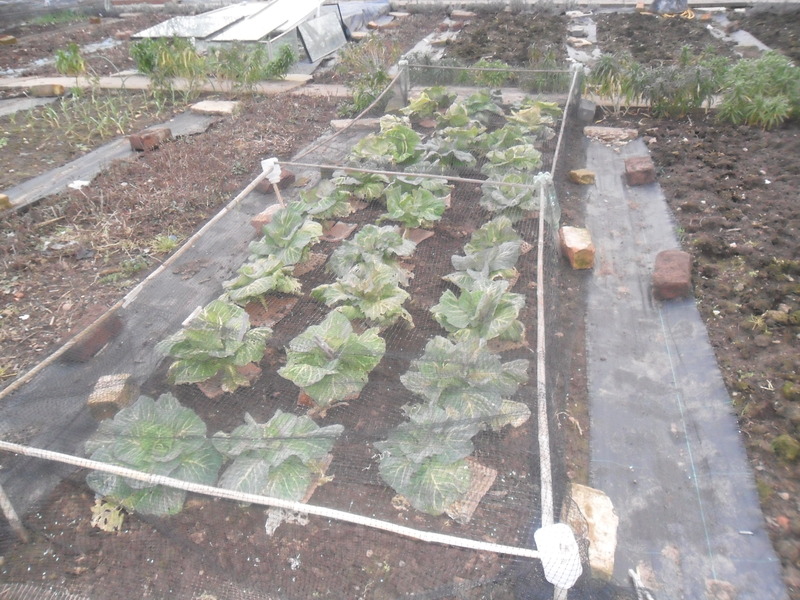 Continue to cover the white cauliflowers with their green leaves bended over them, to protect them from frost and light. 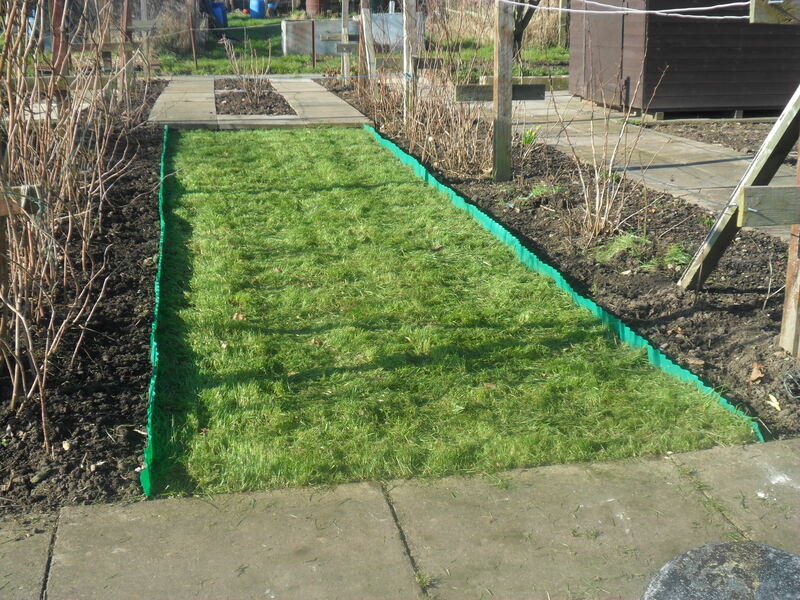 Finish pruning fruit trees and bushes (except cherries and plums) unless the weather has turned very cold. They will start to come out of their dormancy in March. 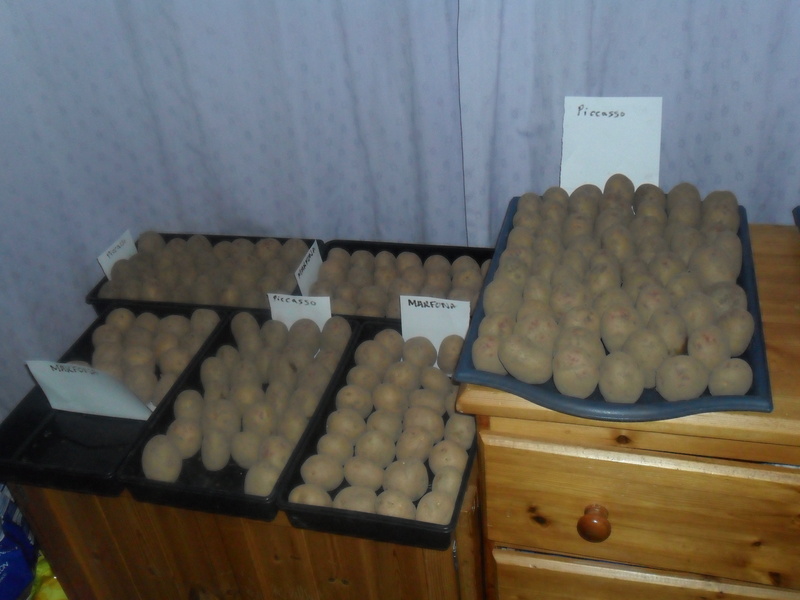 Buy seed potatoes and ‘chit’ them by putting them in egg boxes or trays with their ‘eyes’ facing upwards. Leave them in a cool, light room. Check all your tree stakes and fruit supports are stable and repair if necessary, while plants are dormant. If you grow apricots, peaches or nectarines in a sheltered, south facing spot, then they may start to blossom in February. 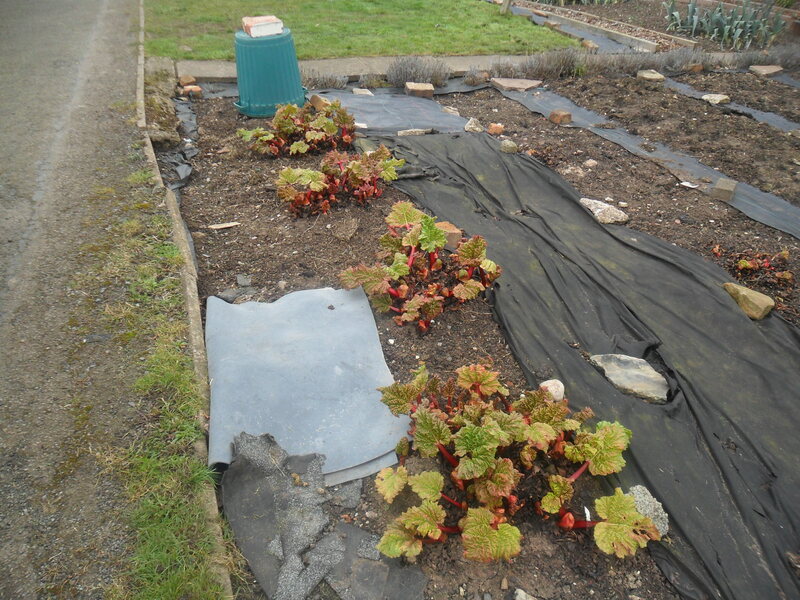 Cover them to protect them from rain and frost. You may have to hand pollinated the flowers. Slugs can still be a problem even in February. Check apple and pear trees for signs of canker and cut out any diseased wood. 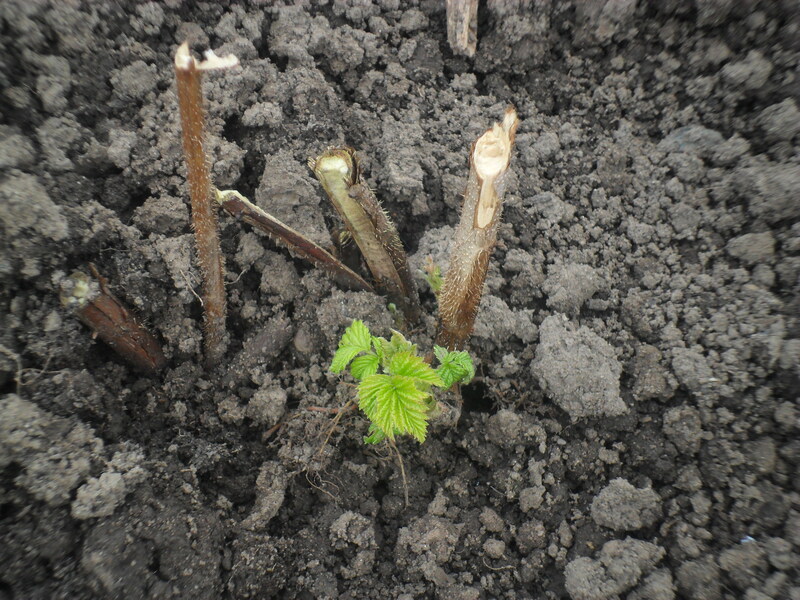 Check for ‘big bud mite’ on blackcurrants. The buds will actually look big and swollen if affected.